Disclaimer: This is UNOFFICIAL. The Intellectual Property of “Warhammer 40K” belongs to Games Works shop. 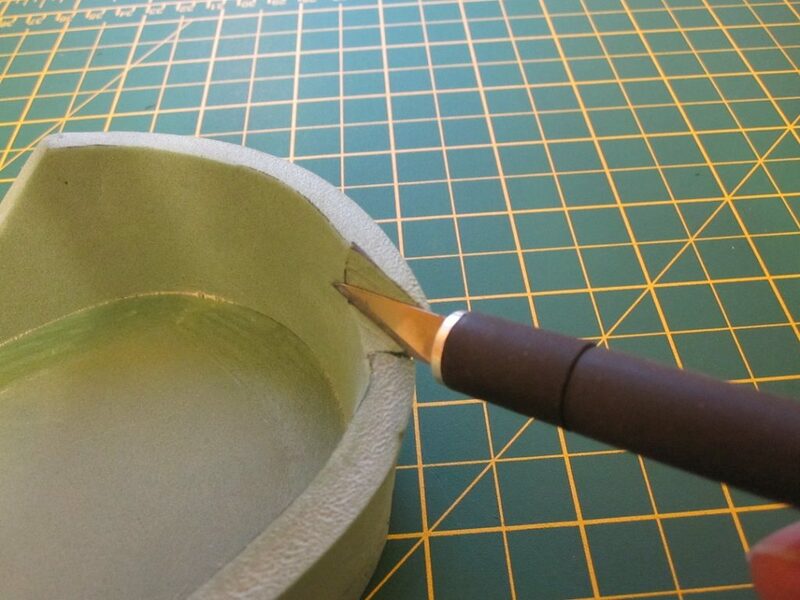 This is just a fan guide on how to make your own wearable helmet. Right, now that I have got that out of the way. Lets get going. 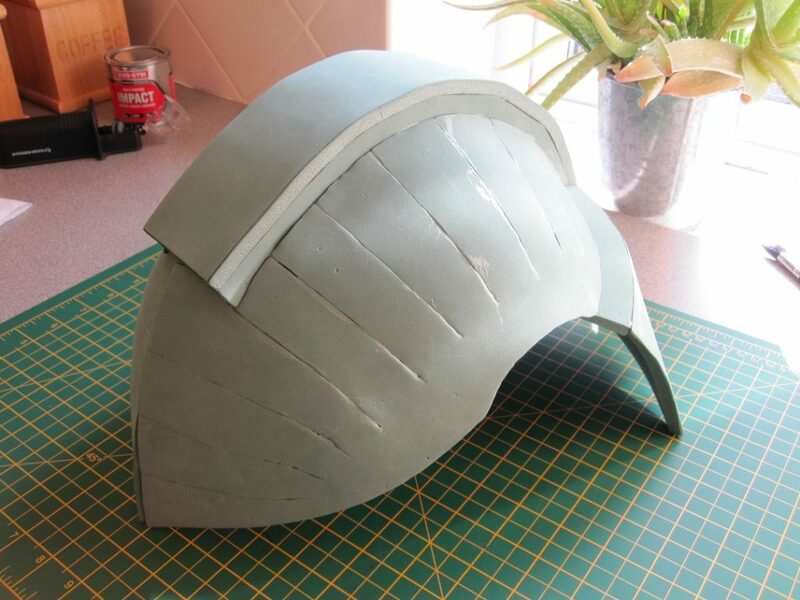 This is a guide on how to build a MK: VII Aquila style helmet as worn by the 40K Space Marines. There are Chapter specific designs. But that’s where you get to have your own fun. 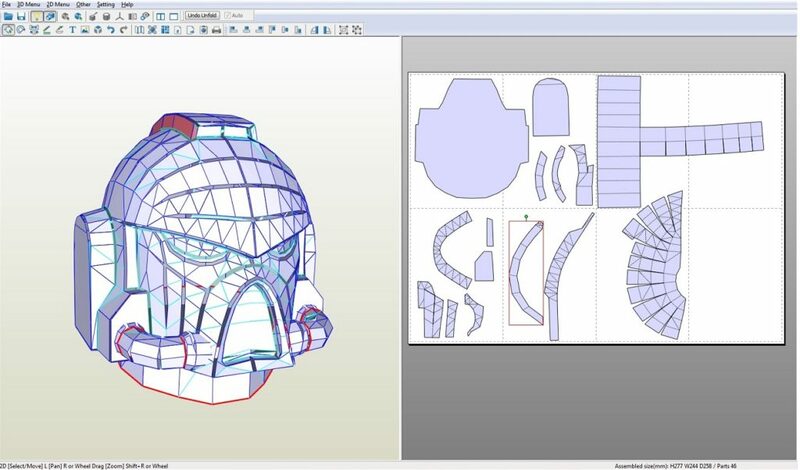 This is just a means so that you can build a generic helmet. After that, you can customise it to your own desires. 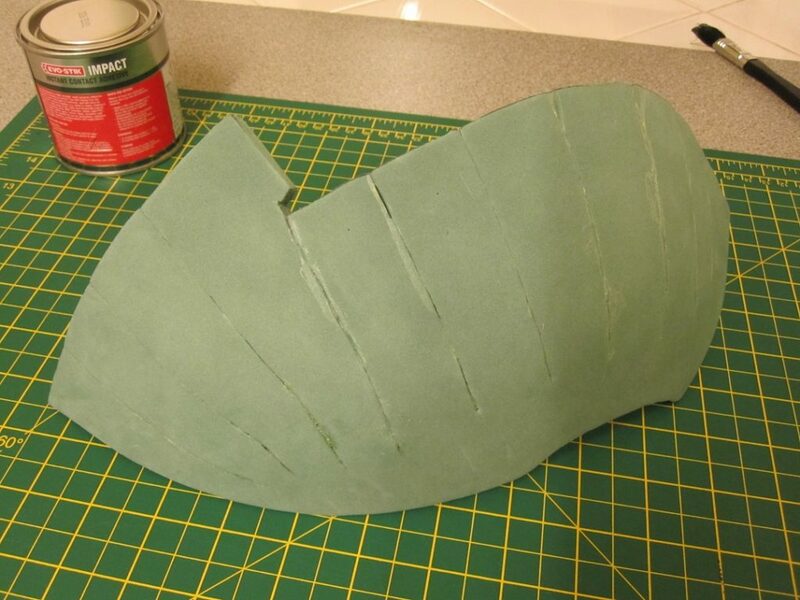 If your new to cosplay building. Then I would recommend that you have a look on You Tube for videos that will give you an insight into the techniques. To point you in the right direction search for “Evil Ted”. In fact below is a link to a video he did on the “Tested” channel. So first up, your going to need some files to work off. And something to view and print them out with. So if you haven’t got this already, then go and search for, and download, “PePaKuRa”. Now up to version 4 at the time of writing this. The viewer is free. If your after Save and Export functions, then you will need to purchase a license. Good. So that’s the viewer downloaded and installed. Now some files. Well good news, there’s quite a few to choose from. There is loads to choose from on “The RPF”, JF Custom put up huge variety. Another example is Henrik Pilerud, who build an awesome Blood Angle, has build pictures and file links off his Facebook page. For the sake of this guide, I used Henrik’s files at a scale of 809. 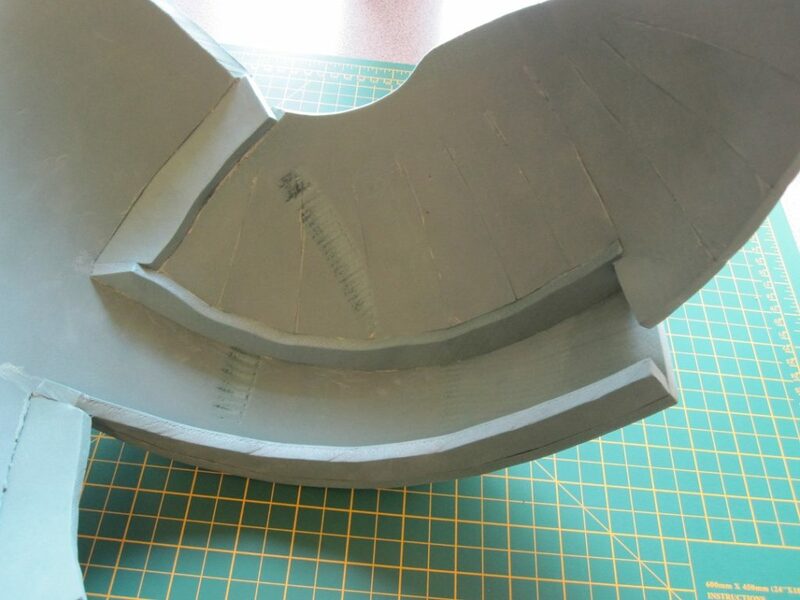 This should produce a prop of 27.7cm high by 24.4cm wide and 25.8 deep. 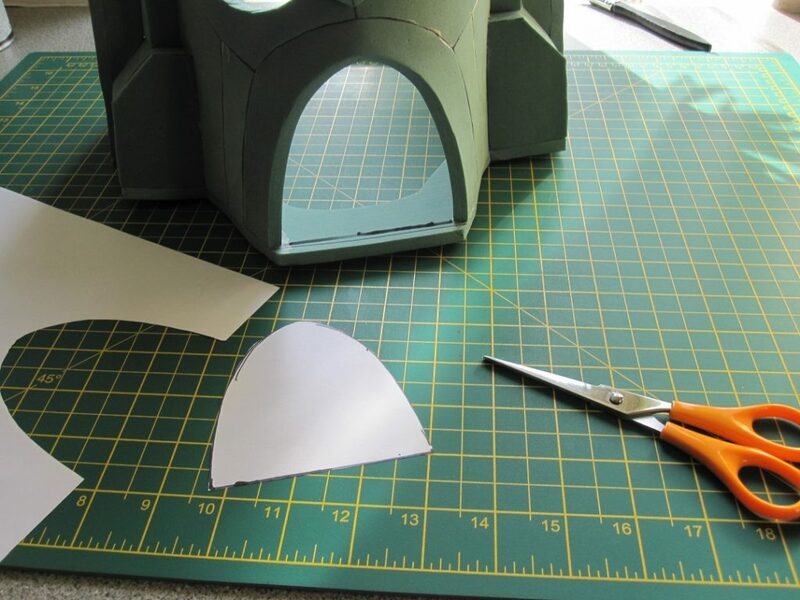 Now I’m not going to assume that you know how to use PePaKuRa. If you do, great & scroll down. So open up PePaKuRa. Once loaded, click “File” then select “Open” from the drop down. Navigate to where the “.pdo” files downloaded and then either double click the file in the new box, or click to highlight and then click “Open”. Great. You should now have a split screen showing the 3D model on the left and the 2D part layout on the right. Now if Henrik’s file is called “Modified for foam – A2 – helmet – 935” Then you will need to do a bit adjustment, unless you have an A2 printer. I’m going to assume that you have an A4 printer. 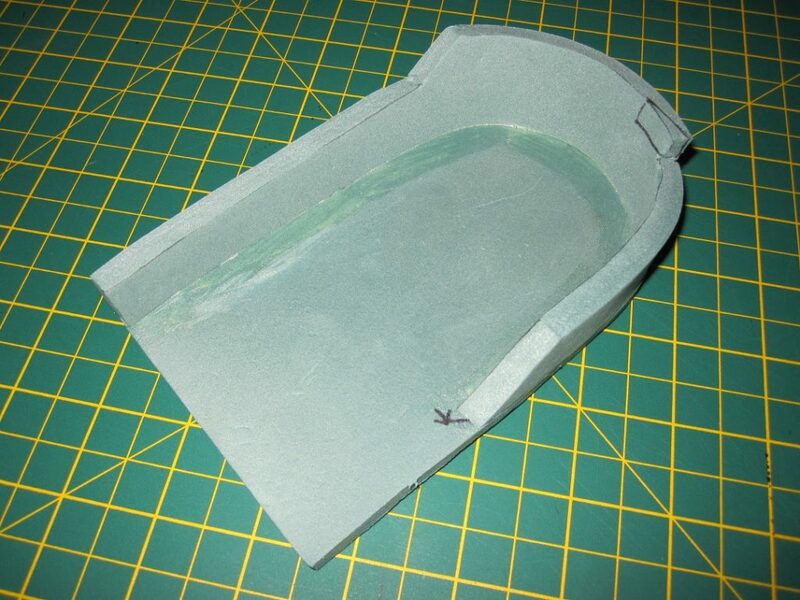 So lets set up PePaKuRa to use A4 and a couple of easy life settings. So top left corner. Click “File”. Then select “Print and Paper setting”. This should open up a box. So at the top, paper size. Select “A4” from the drop down. Orientation can be set to your preference. But for the sake of this guide, select “Portrait”. For the “Side Margin (mm)” set this to 5. And also for the “Top/Bottom Margin (mm)”, set this to 5. This just means that you print out to A4 will have a 5mm boarder. So a good usable area, but with enough of an overlap for sticking together the bigger templates. 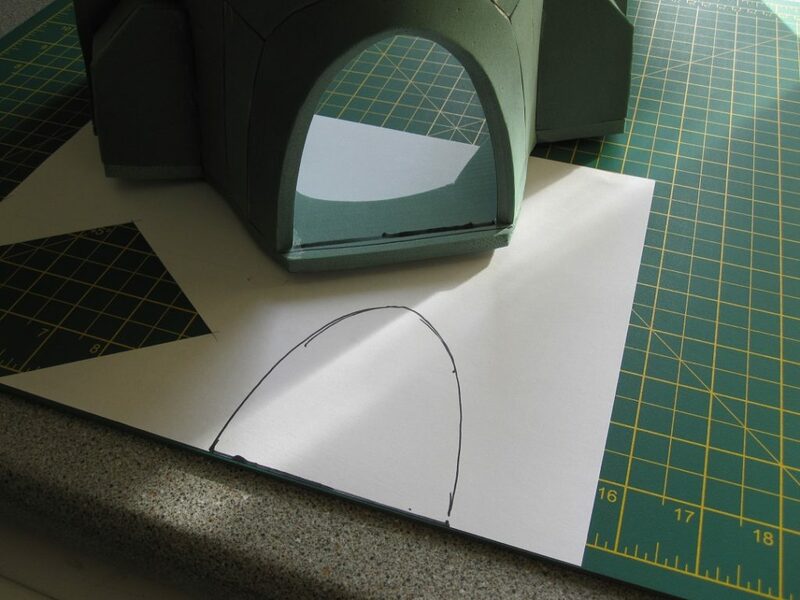 For “Line weight” select “7” as this should give a good thick clear line to cut along. With that in mind, select “Print lines clearly (Vector Print). For “Transparency” move that all the way across to “0%”. Then select “Print alignment marks on multiple pages”. Bitmap resolution should be “High”. Excellent. But you may have noticed that the pattern isn’t so nicely arranged any more. But before you go arranging the pieces, lets set the scale to “809”. So top left corner, click on “2D Menu”. Then hover over “Change Scale” and then select “Set Scale”. This will open up a new box. Towards the bottom you should see “Scale”. Simply change this to “809”, then click “OK”. So why 809 scale? A good question. But I can’t give you a simple answer, beyond “it’s what fits me”. Now in 40K, Space Marines are bloody huge! They’re giants. Genetically modified super soldiers there to defend the Imperium of Man. I am not genetically modified. I’m five foot 10 inches tall. So making an 8 foot tall scale Space Marine would mean I’d end up on stilts. With my feet in the knees and hands in the elbows. Now if that’s you idea of awesome, then good for you. But I scaled it down to be wearable for me. And to keep the scale across the entire outfit, this is why the helmet has gone down to 809 scale. Basically you can make this as big or small as you like. So back to PePaKuRa. This is where you get to arrange the pieces to the A4 overlay. 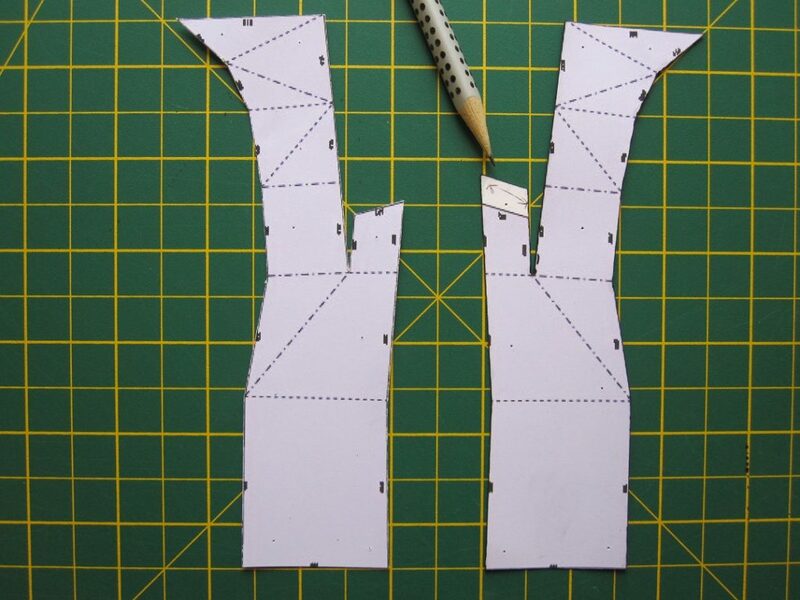 Good news, in some cases you only need to print out one half of a pair of templates. As once they are printed out and cut out, you only need to flip them over to get their mirror. So left click and hold on a piece to move it about. In version 4 of PePaKuRa you may notice that a “green pin” appears at the top of the red outline around the pattern piece. Left click and hold on this will allow you to rotate the piece. If I may make a suggestion, then a layout over 7 pages of A4 that looks a bit like the picture below would be good. With that done it’s time to fire up your printer. So top left hand corner. Left click “File”. Then left click “Print”. This will bring up a new box. Check that all looks good for your printer and then left click the “Print” button. So you should have 7 A4 pages printed out. 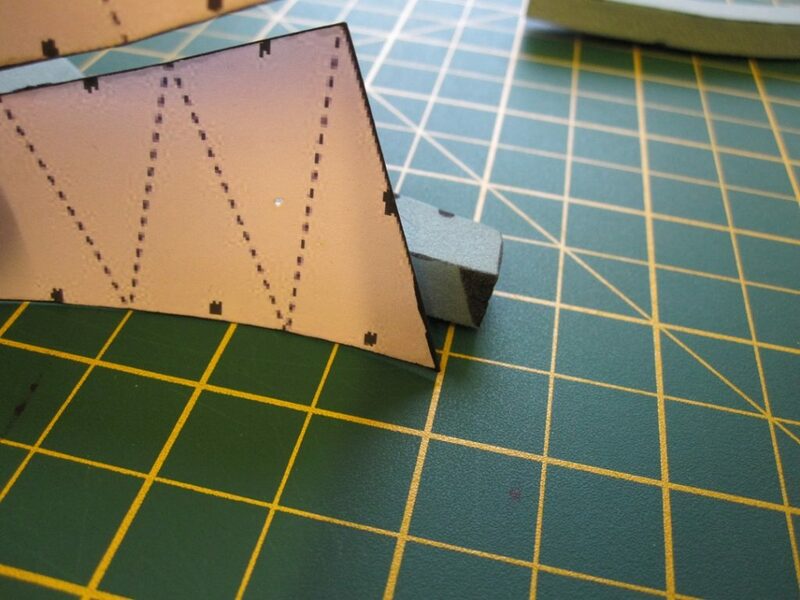 And as some of the parts are bigger than a single sheet of A4, that is where the alignment marks come in handy. So get yourself a 30cm ruler and either a pen or sharp pencil. You will also need some sticky tape. First up, use the ruler to join up the top and the bottom lines on the right hand side of the page. Then join up the lines along the bottom of the sheet. For the above layout, you only need the right hand line on the first page & third page. And only the bottom line on the third page. This is for the few parts that overlap multiple pages. 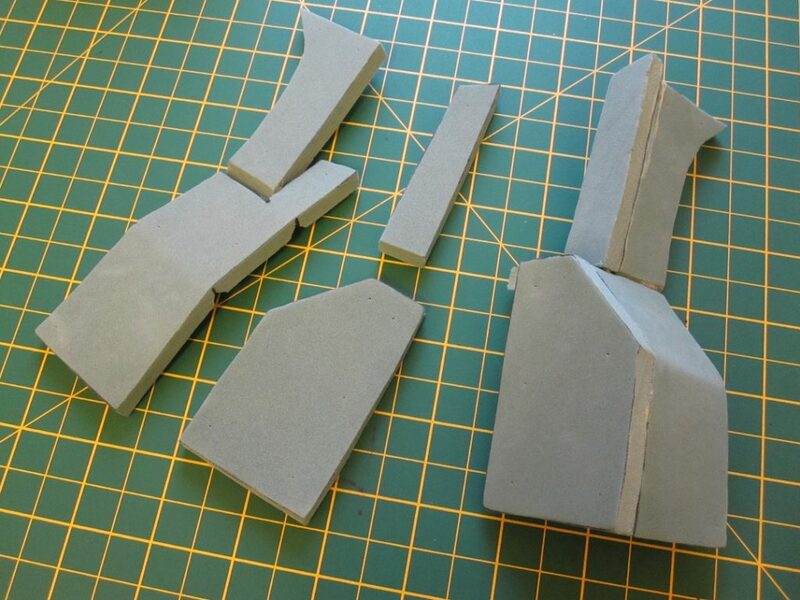 But if you find yourself making larger items (Space Marine chest armour for example) you will need to do this for more of the print out. 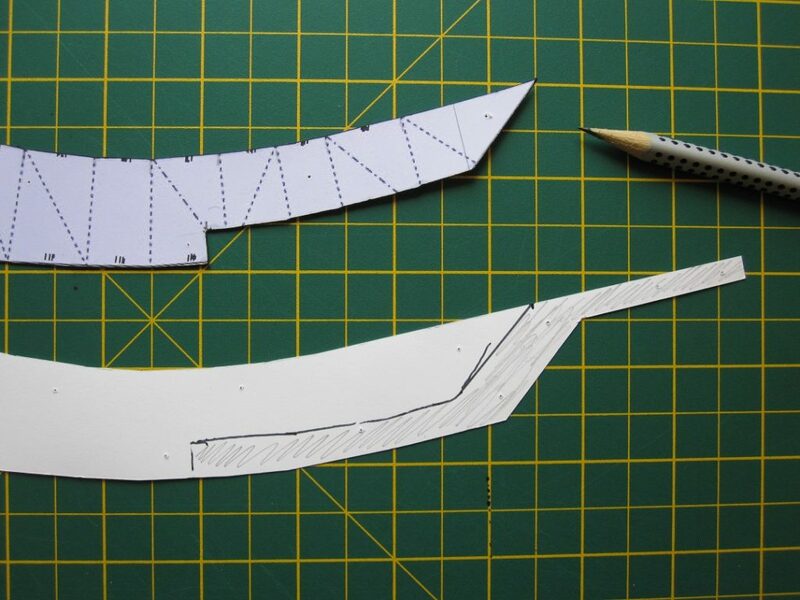 Now that you have your lines draw, it’s time to cut along them. If you have a guillotine, then excellent. If not, then get out your scissors and cut along the line. Once that’s done, you should find that your pages line up at the top and bottom to the marks on the next page. And as such, your pattern will also line up. So using sticky tape, stick the pages together. 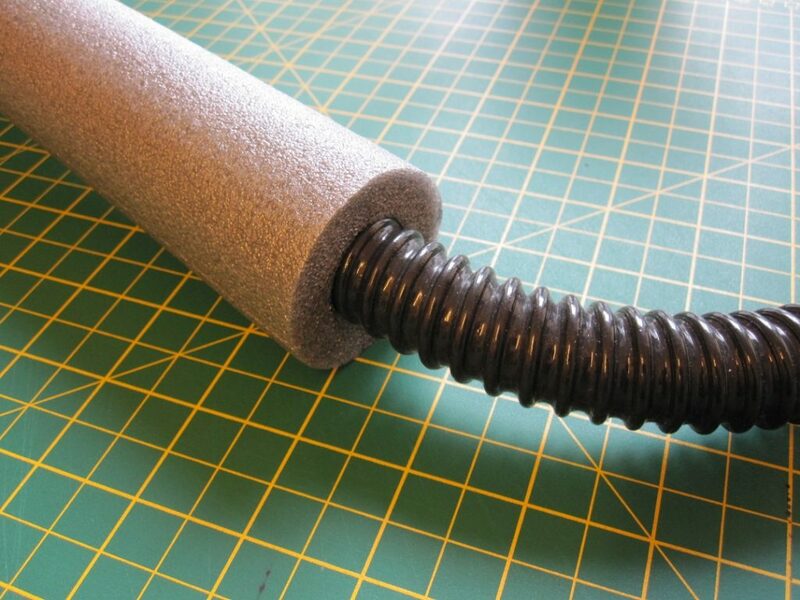 You don’t need to tape the entire length. Just tack the top and the bottom. Then stick along the pattern join line. And I would recommend doing that on both sides of the pattern. So if you were scrolling down, this should be where we all catch up. Now the next bit will involve some modifications. The patterns you have printed out are more than likely from the Space Marine video game. And if you were to print them all out in paper or card with the flaps added, then you would find that the model goes together great. But I’m going to assume you’ve purchased yourself a sleeping/yoga mat that’s anywhere between 6mm to 8mm thick. So as I found out when I first did this, there are some complications. So to save you from that, here is what I learned. 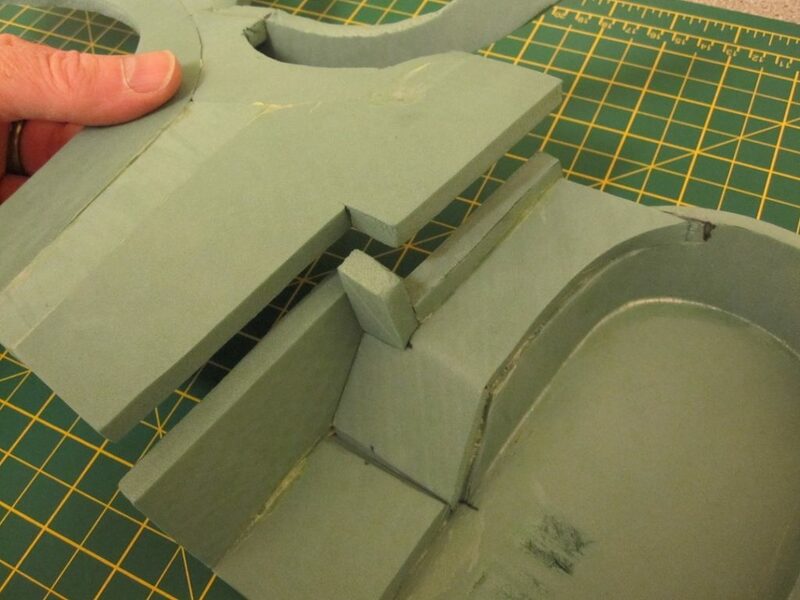 You will need to cut an opening big enough to get your head through. 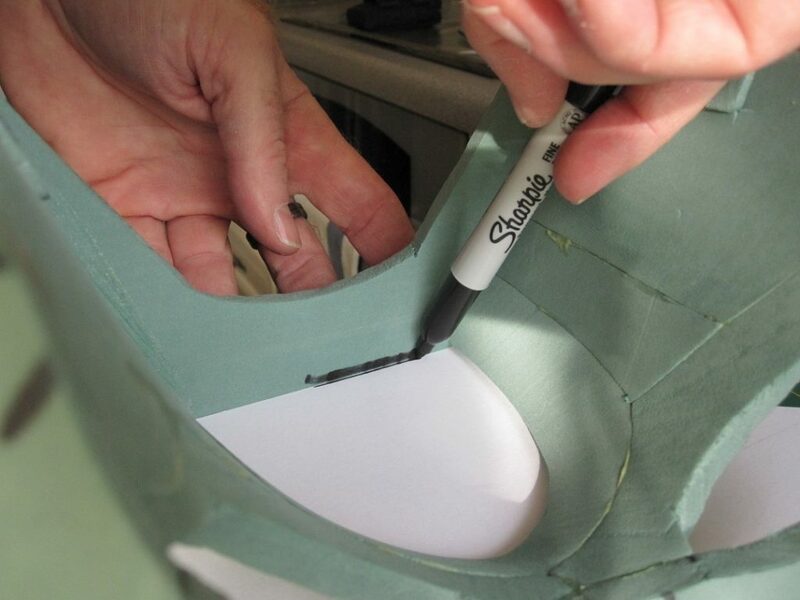 If you have protractor use that to mark a circle that follow the contour of the back of the helmet. Then open it up for the front. Then just join the lines together and cut out. Or you can use dinner plates or bows. Or you could even free hand it if you like. It’s going to be your creation at the end of the day. The “T” piece can be made a lot simpler. 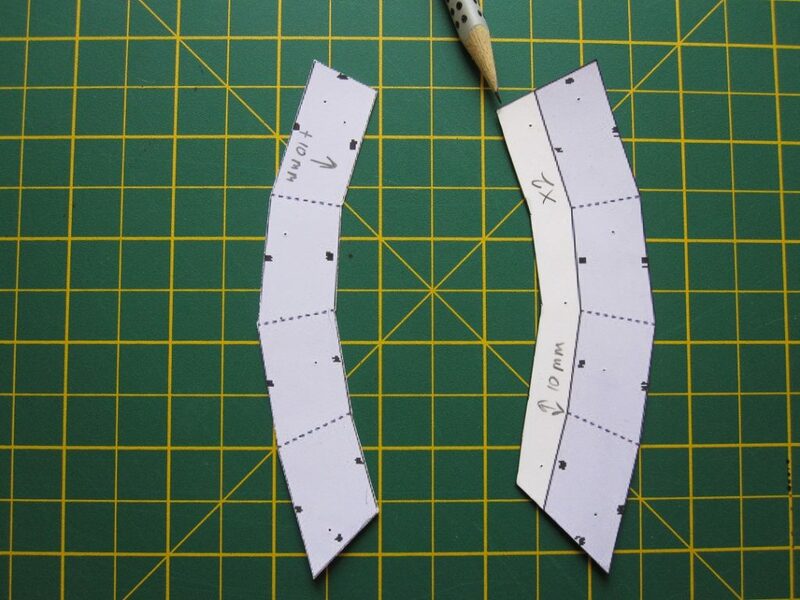 The curved and darted part can be cut straight. On mine it’s 7.2cm wide. And 30.9cm long. Basically just have a straight “T” cut. No need to curve, it’s foam. It will curve just fine. 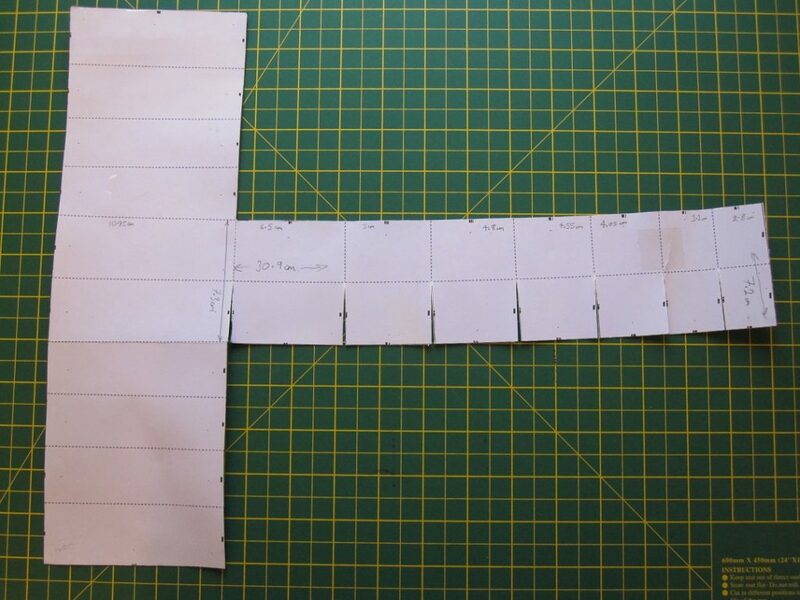 It just needs to be 90 degrees to the rest of the pattern, 30.9cm in length and 7.2 cm wide. 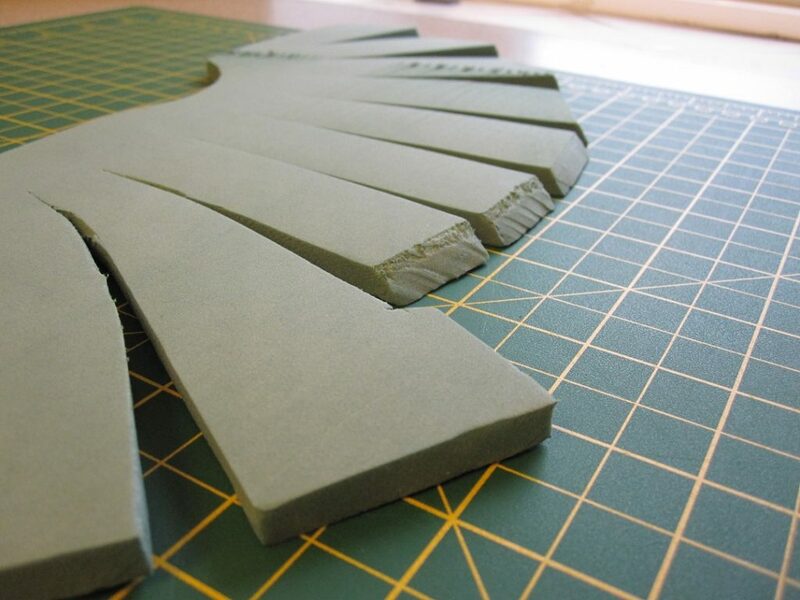 For this pattern, add the thickness of your material to. So if your sleep roll is 6mm, add 6mm. If it’s 8mm, then add 8mm. It will make sense when you come to glue it together later on. 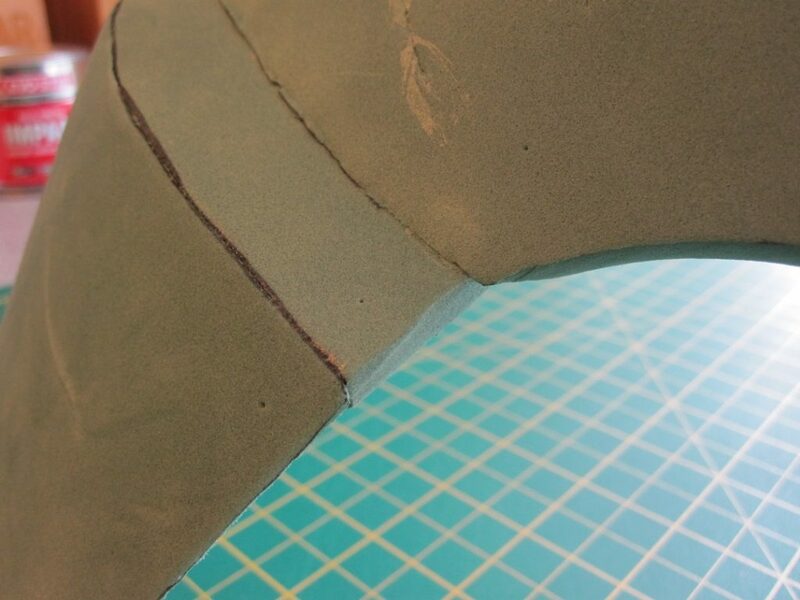 This curved pattern needed an extra 1cm adding to the inside edge. This part required lengthening. I added 9mm to be sure. 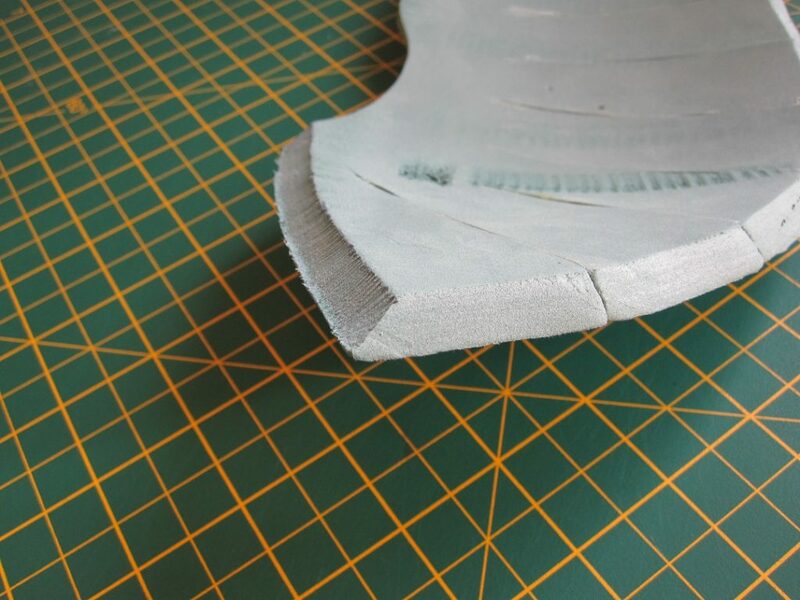 This pattern required a bit cutting off. So go ahead and square off the end. So this is a bit more fiddly. 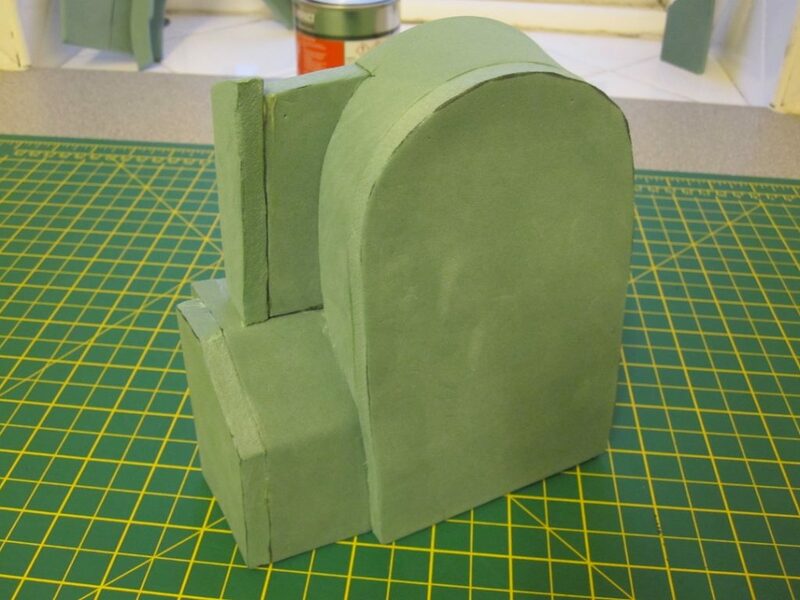 Again, as your going to be using a foam sleeping/yoga mat, instead of paper, some of the parts don’t line up due to the thickness of the material you are using to build. 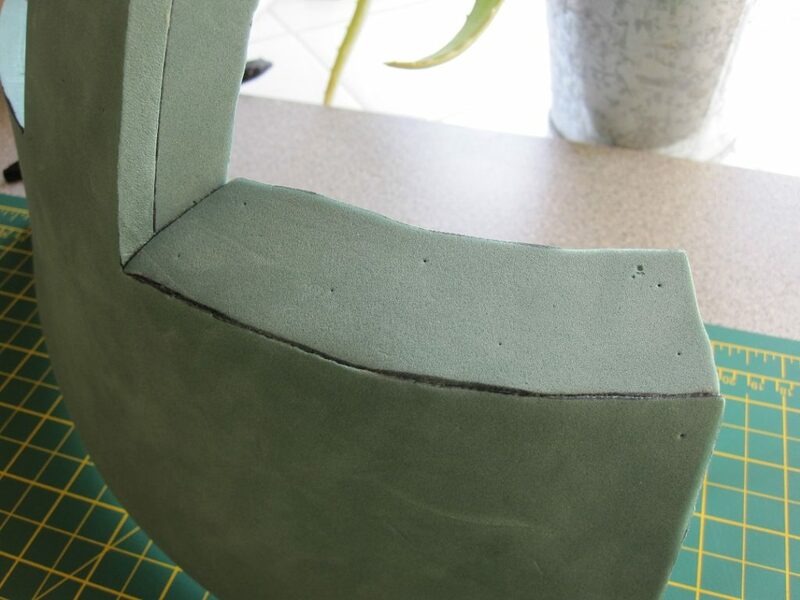 This pattern I would hold off on modifying until you have cut out the patterns for everything else in foam. That way you can offer it up and mark it up prior to cutting. So now the fun part. 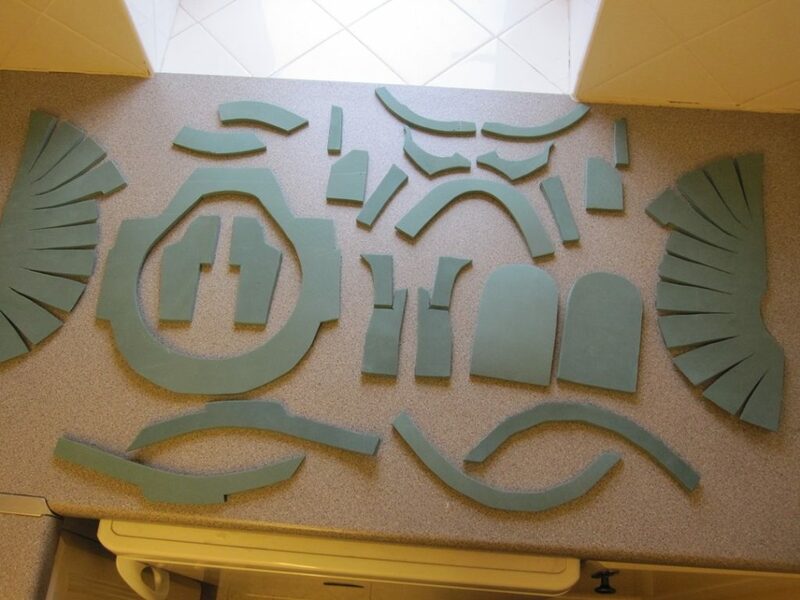 Cutting out all the parts. I found pinning the paper to the foam and then tracing around the outside with a Sharpie (or other marker pen) gave a good transfer of the pattern. 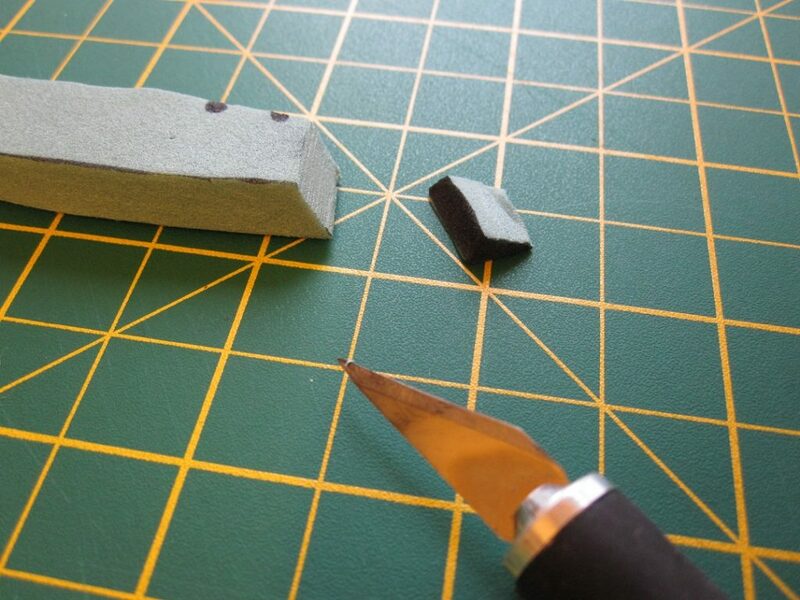 Then using a sharp craft knife, or scalpule, or X-acto style knife to cut them out. And vitally important is a sharp blade. Weirdly foam blunts blades unbelievably fast. So either have a lot of blades. Or a blade sharpener. I used a Kitchen Devil on my craft blade. Did a really good job of keeping the blade keen and sharp. It makes a lot of difference to how clean the cut is. And also how easily the blade passed through the foam. So to reiterate, make sure your blade is sharp. And don’t worry if you make a mistake or few. I believe that it was Adam Savage that said he told his kids that they should be prepared to build something three times. So with that in mind you should have enough foam sleeping/yoga mate to have spare. After a while you should have a pile of scraps and off cuts. 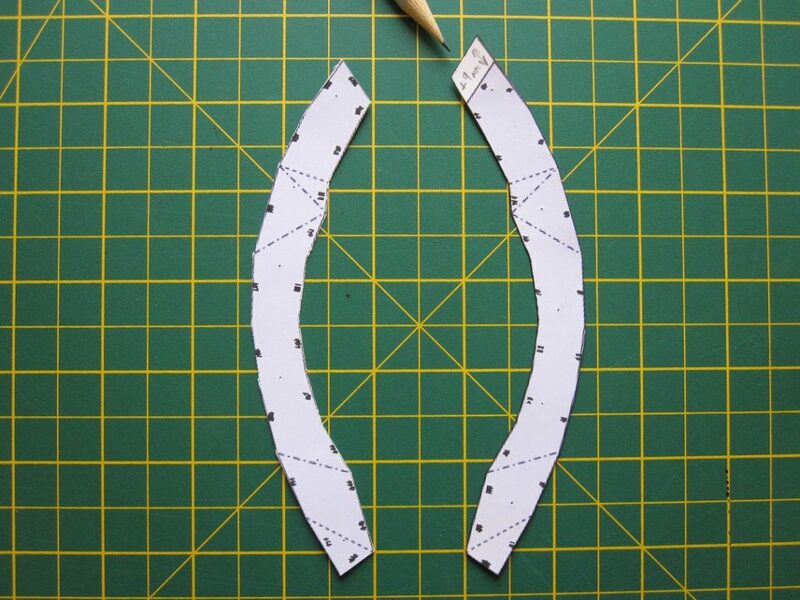 But more importantly you should have 26 parts that look a little like this. 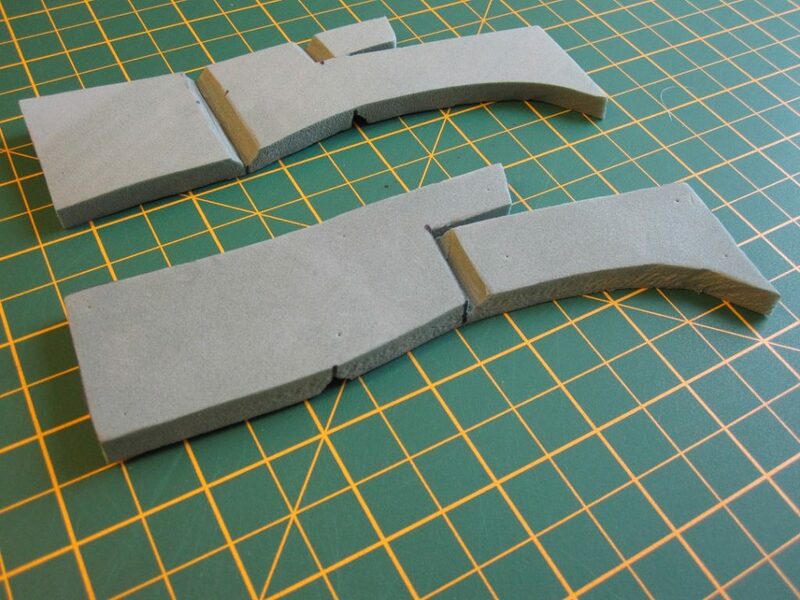 The next step is to tailor and/or chamfer some of the parts so that they should fit together. 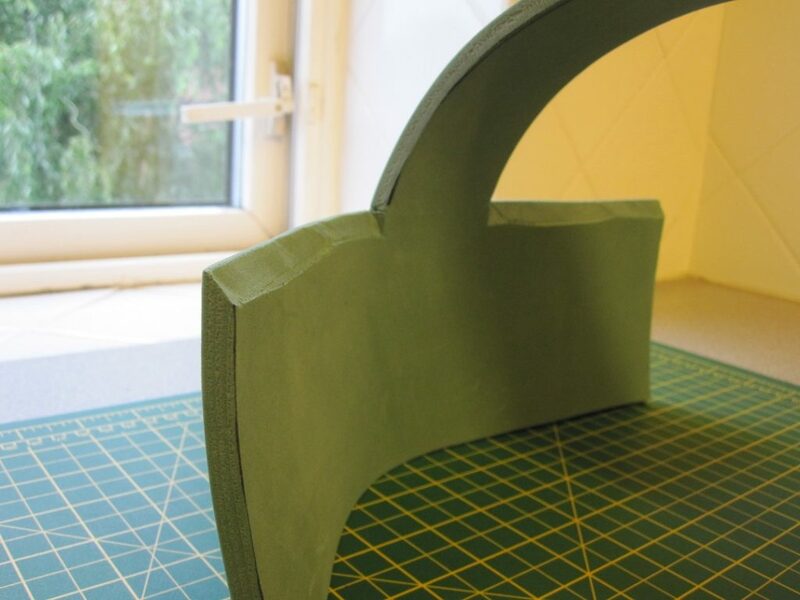 So remove a bit of foam from the back of the bend. If in doubt, cut away less than you think. Because you can always cut away more later if needs be. 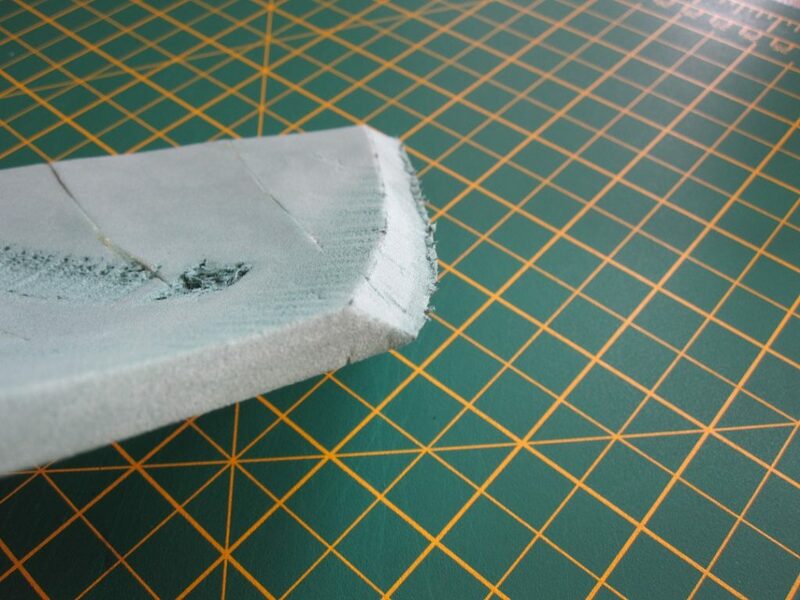 But undoing a cut is not always simple. Above all, do not worry if it goes wrong. It’s just foam. Just cut out another piece. So here we have the left and right pieces. So in this case, the nearest part is for the left of the helmet. And the furthest is for the right side. And in this above image shows the reverse side. Basically so it will bend like this. 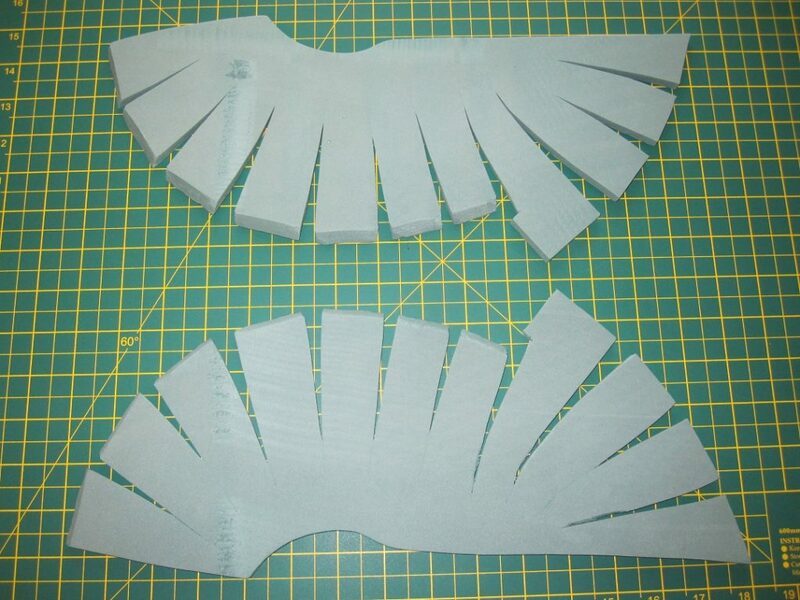 Now on to the 2 parts that look a little bit like fans. On these there are a series of 45 degree cuts to be made to some of the blades. The fans that will eventually join to the top ridge need a chamfer cut. The front 4 need to be left square edged. 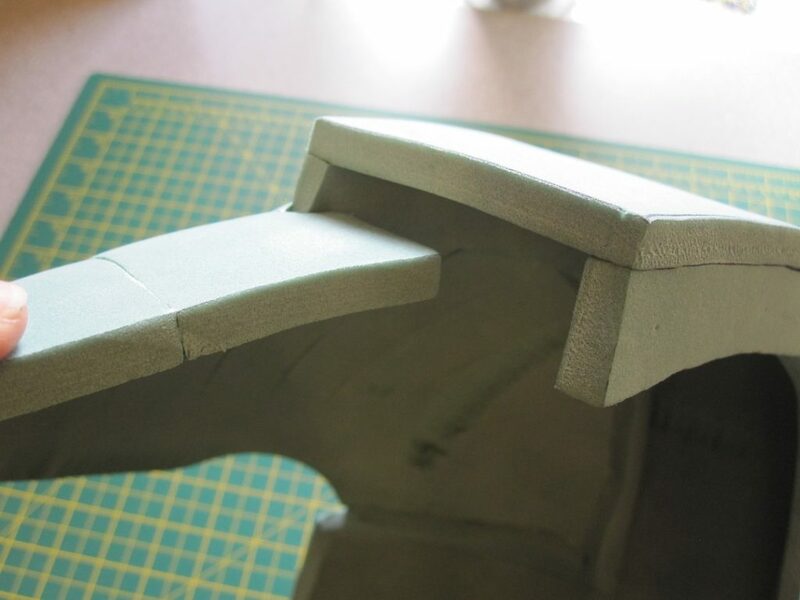 In addition, the rear edge will also require 45 degree cut. Yes, I know that the last 2 photos have been stuck together. I forgot at the time. But while we’re cutting out, it’s worth doing now. 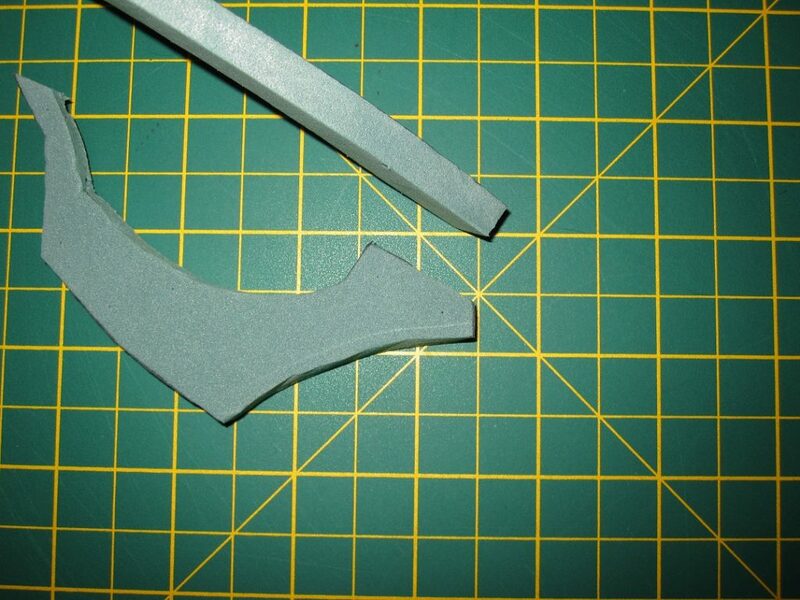 Several edges on the “T” piece that joins the back and makes the over to top ridge need a 45 degree cut. Note: I forgot to take a photo of it. 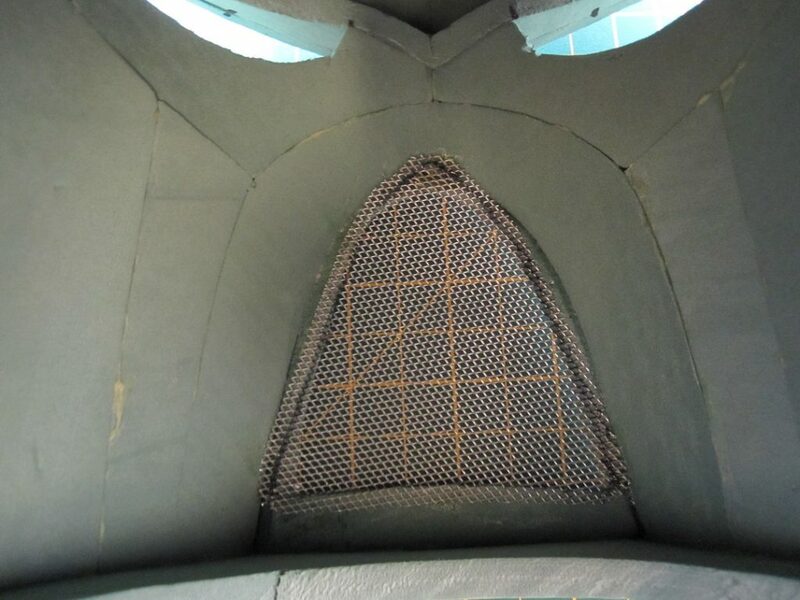 But you will also need a 45 degree cut to the bottom vertical edge on the inside. This will be for when the back piece joins to the back of the ear guard. 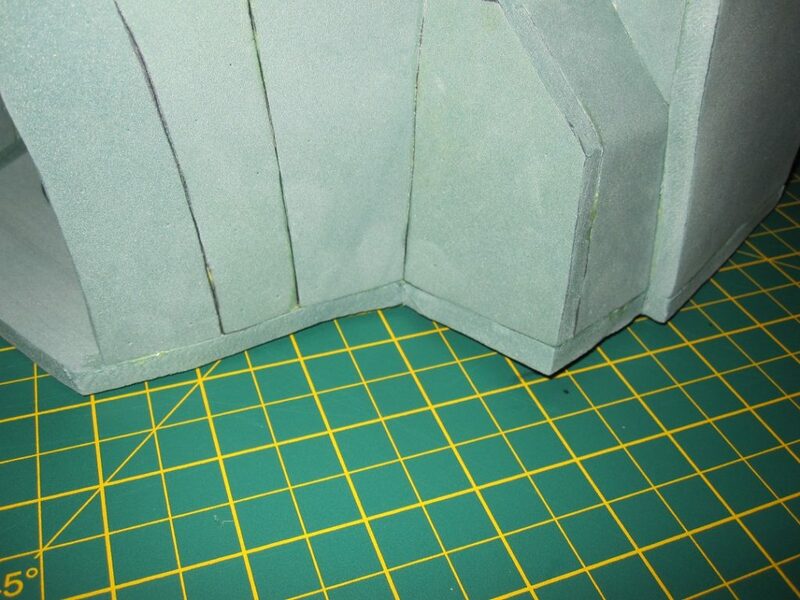 It can be done as a square cut, but it will try and open up the join. A chamfer just makes for a better join. I know it’s going to be “behind” the face of the helmet. But it’s worth mentioning. 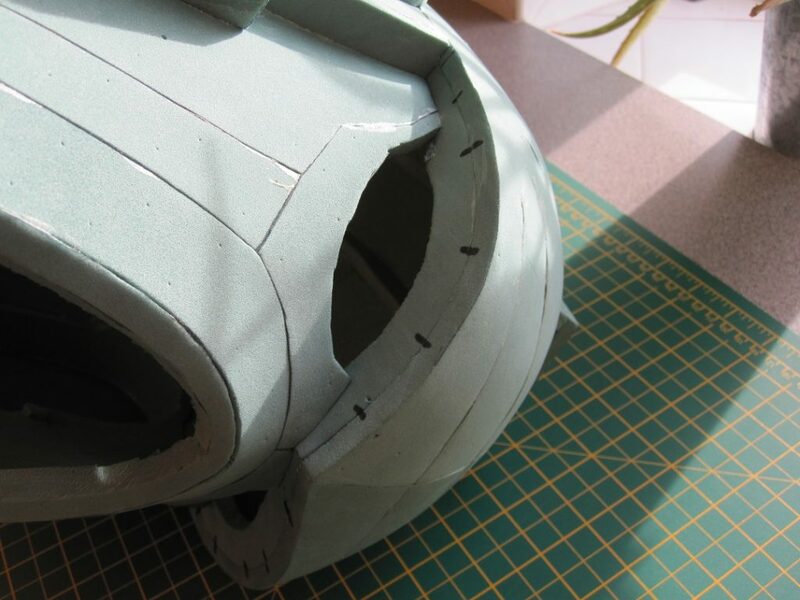 For the next modification, this will require the parts that go over the eyes. 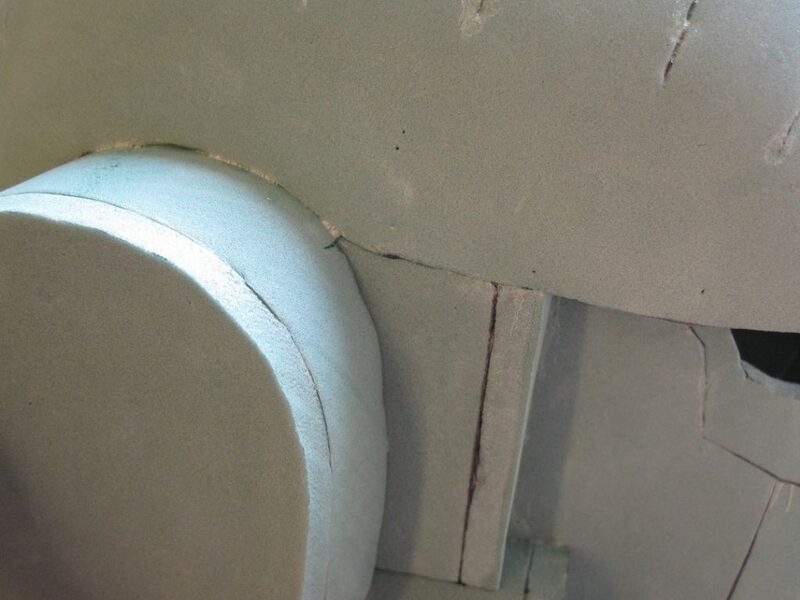 As you can see an angled cut will be needed. Happily, the top fan template has the angle. Offer up the template and just mark off the small part you want to cut off. 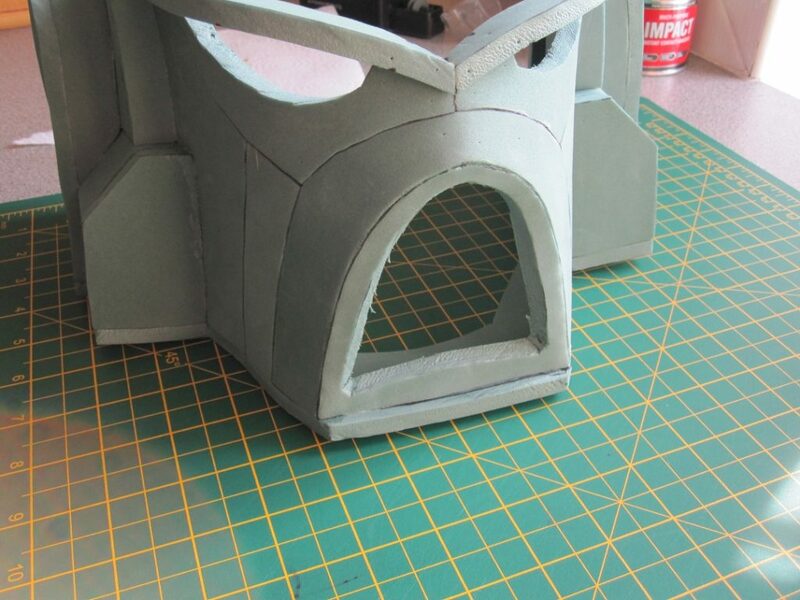 Make the modification to both foam templates. Now it’s time to start to stick these parts together. Now there is no correct way to put this together. After all this is only a guide. Not an actual manual. 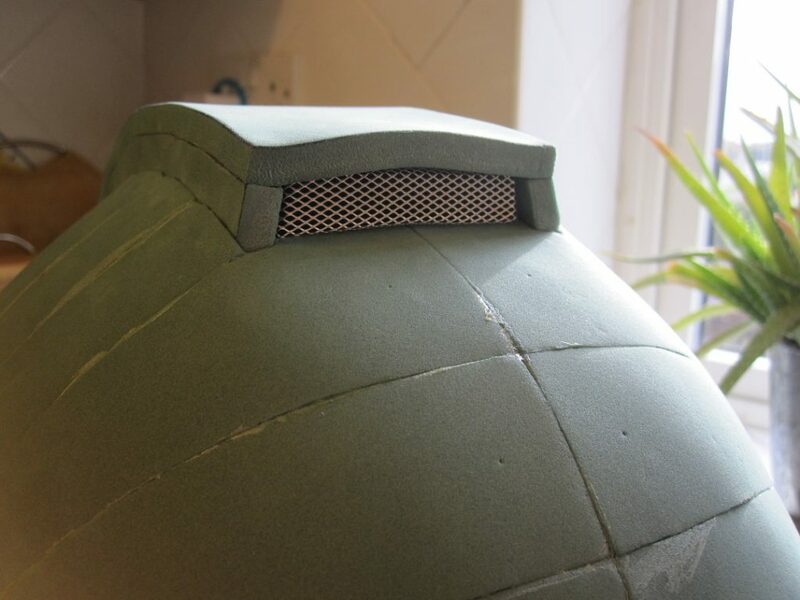 So if you want to construct your helmet in a different and better for you order. Then all kinds of good. For the sake of this guide, I’m going to make a start of the face. So go ahead and gather together the following parts. As for glue, this is also a personal choice. 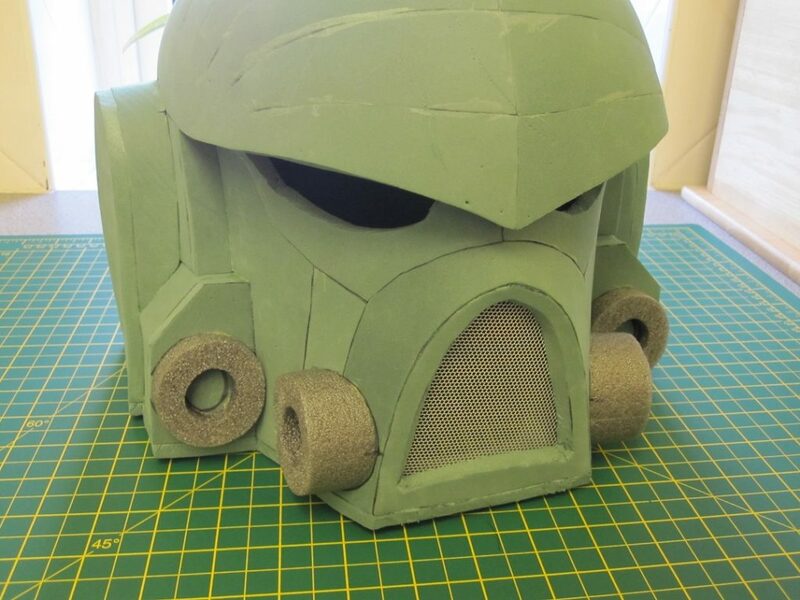 The first foam helmet of this design I made some years back, I used a hobby hot melt glue gun. That helmet is still just about in one piece. 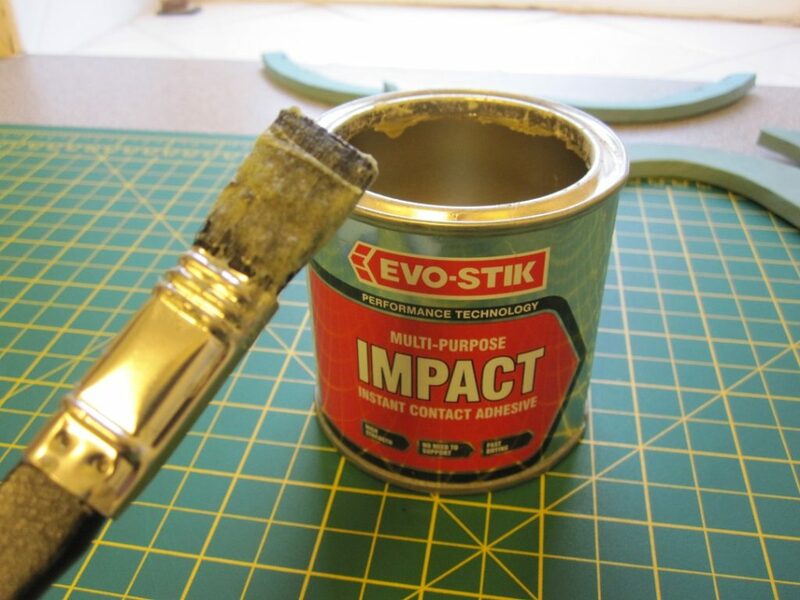 But since then I have been using contact adhesive. Again, It’s personal preference as to what method you wish to use. Hot melt worked well for me. But I found it a bit tricky to apply and stick before it cooled. But it could be melted and pulled apart. However that tended to be very messy. 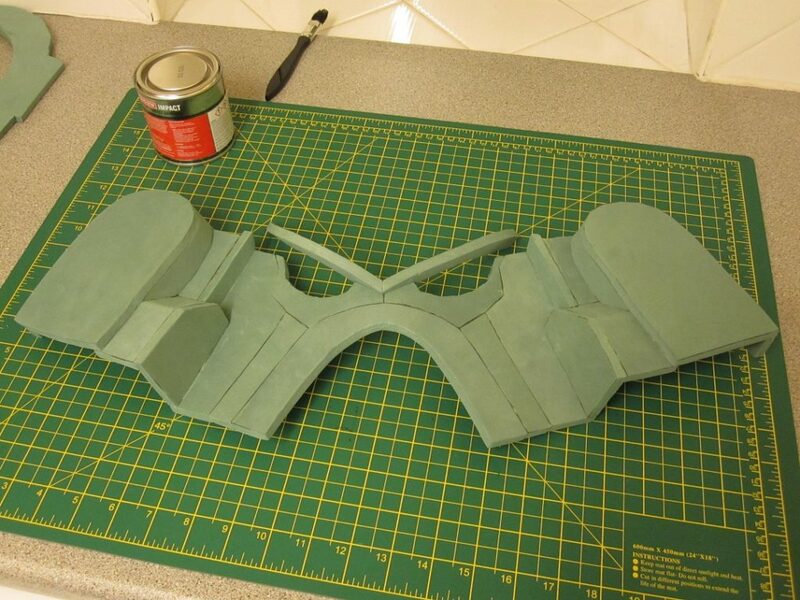 The contact glue gave more time to line up parts. But if it sticks where you don’t want it to, then it will need to be cut apart. Again, it’s down to your own preference. 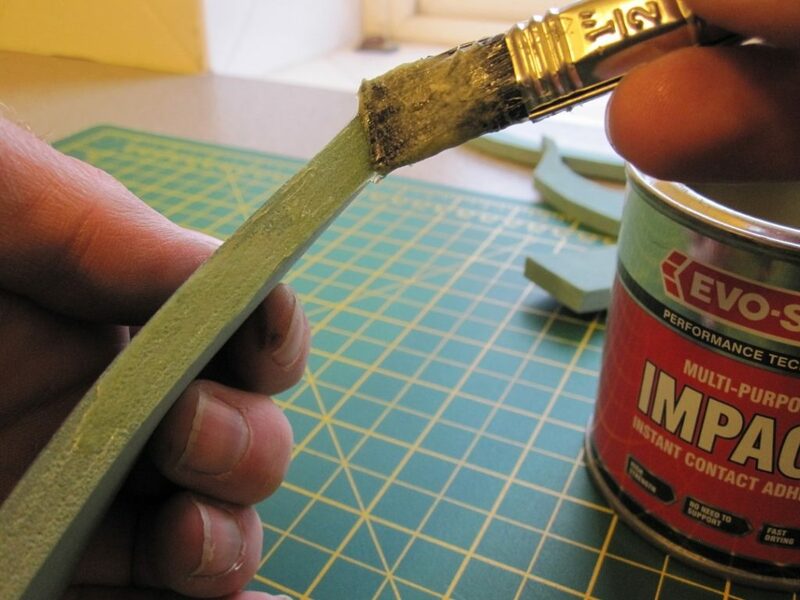 Simply apply a thin coat to both surfaces you wish to join. And once it goes from shiny to satin (3 to 8 minuets) it’s read to stick together. 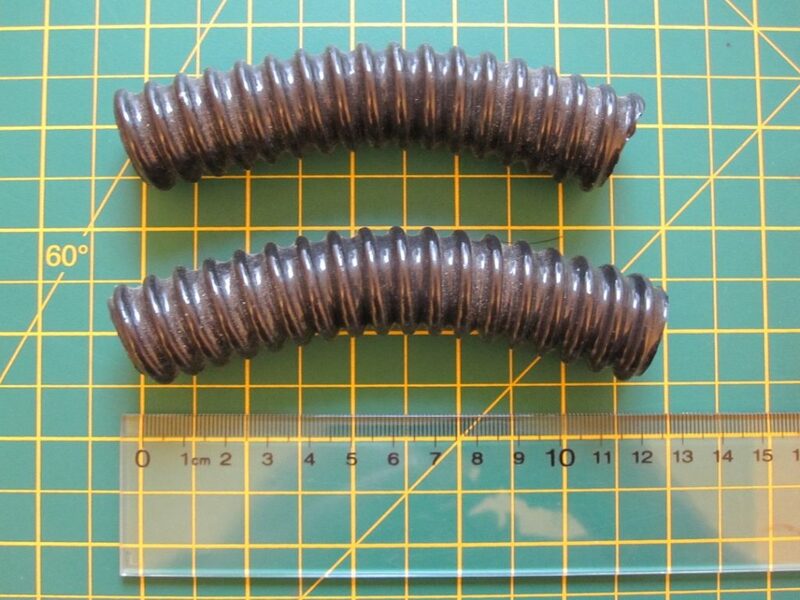 You should eventually end up with an assembled part looking like this. 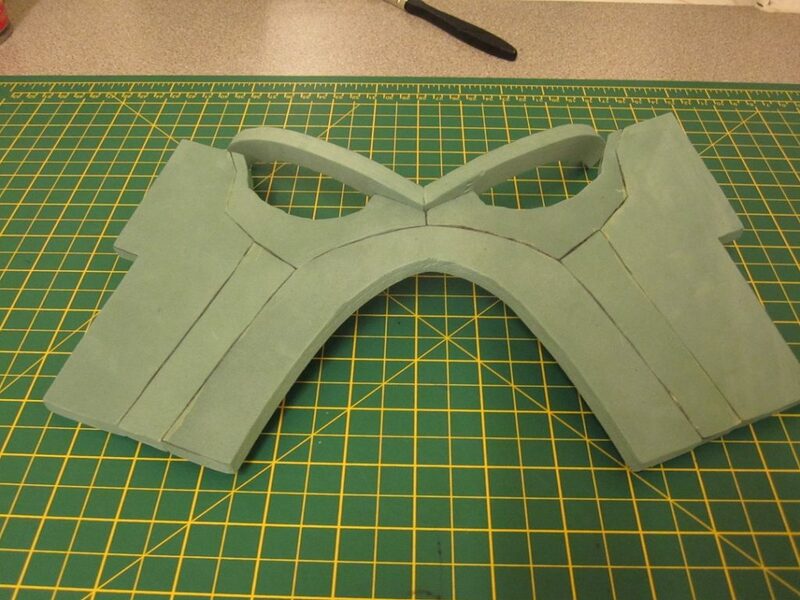 The eyebrows part can then be glued together and attached to just above the nose. 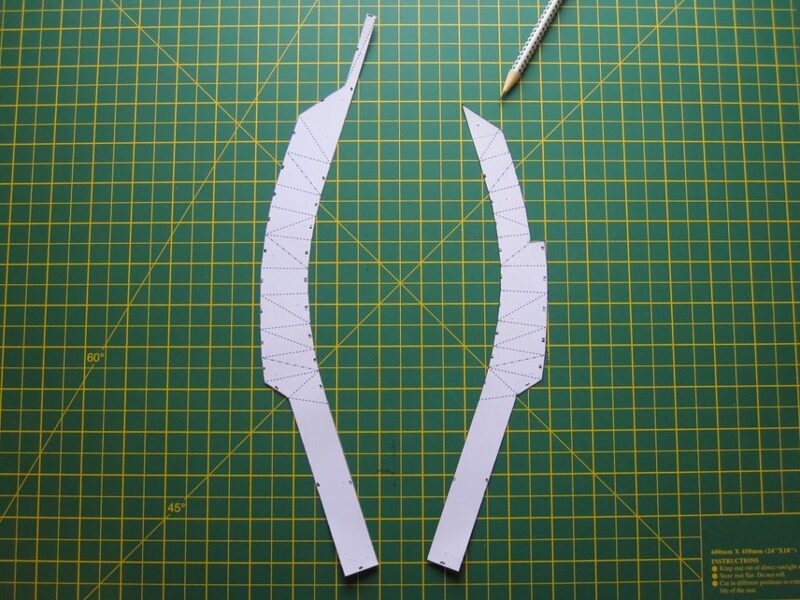 Leave the bits that are pointing towards the ears unglued for the time being. 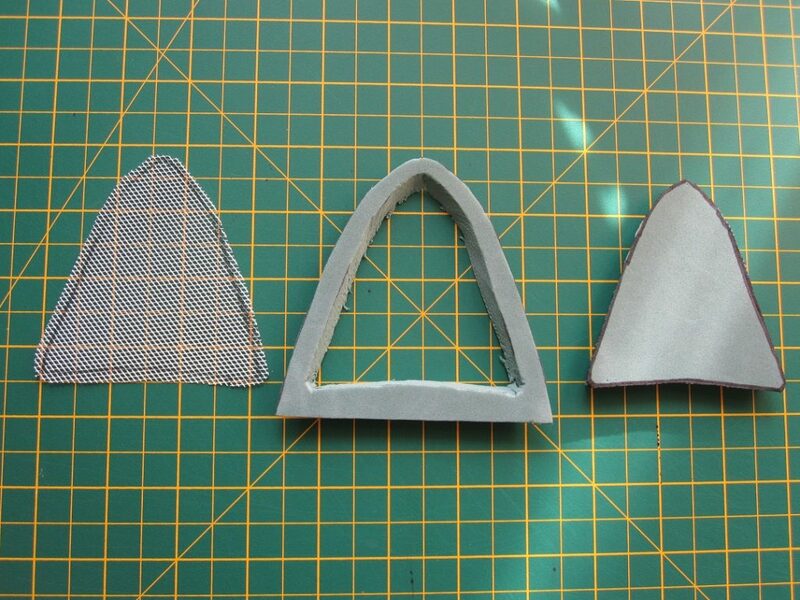 Next up is the leading part of the ear covers. For these the flat items will be the leading edge. 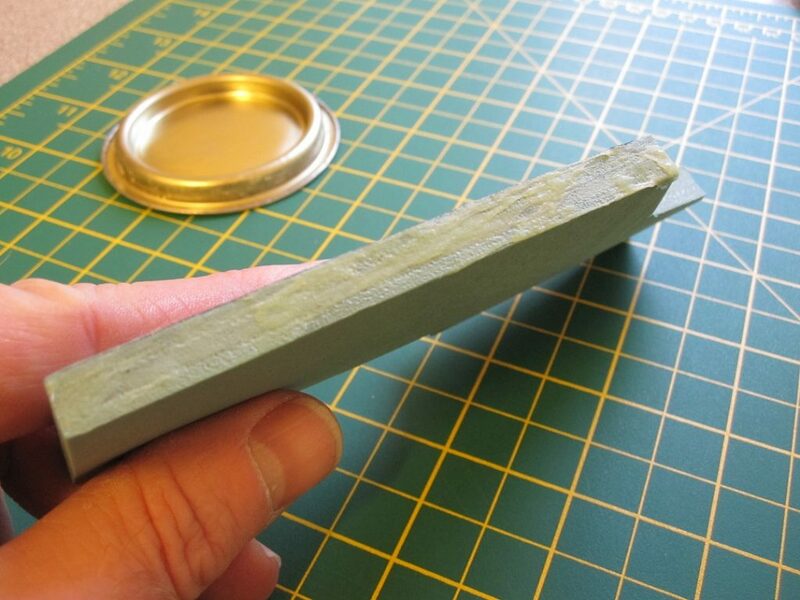 So that you will be applying your glue to the large flat surface, rather than the edge. 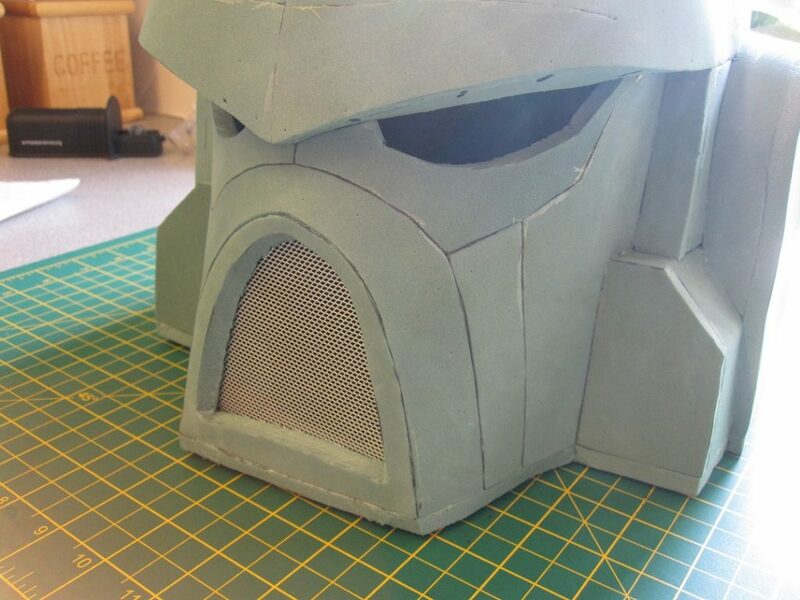 Next up will be the 2 parts for the ear guard. This is where holding off from cutting down the pattern from earlier should come in. The original model works in paper / card. But the foam is any thickness. 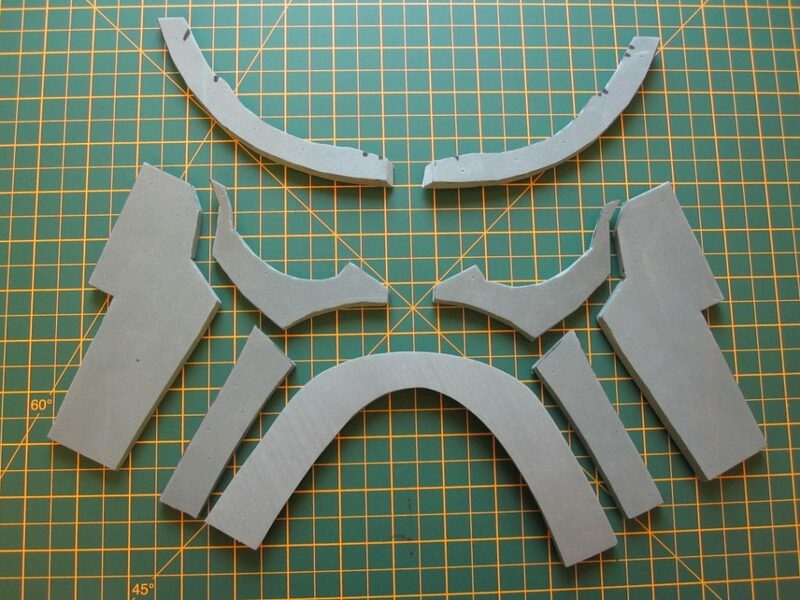 So now your assembling your parts, you will begin to see how the cutaway should work and join the parts together. 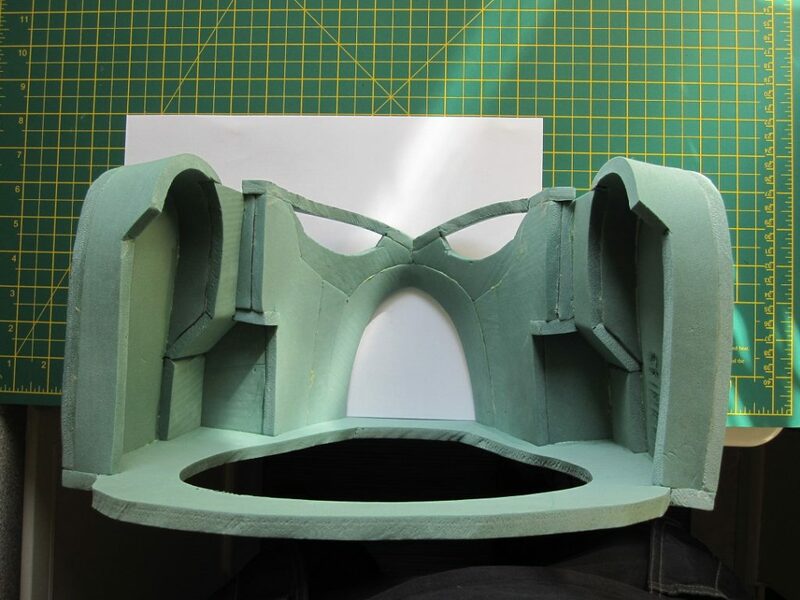 The thin edge will effectively be made up of the thickness of the foam on the outside of the ear guard. 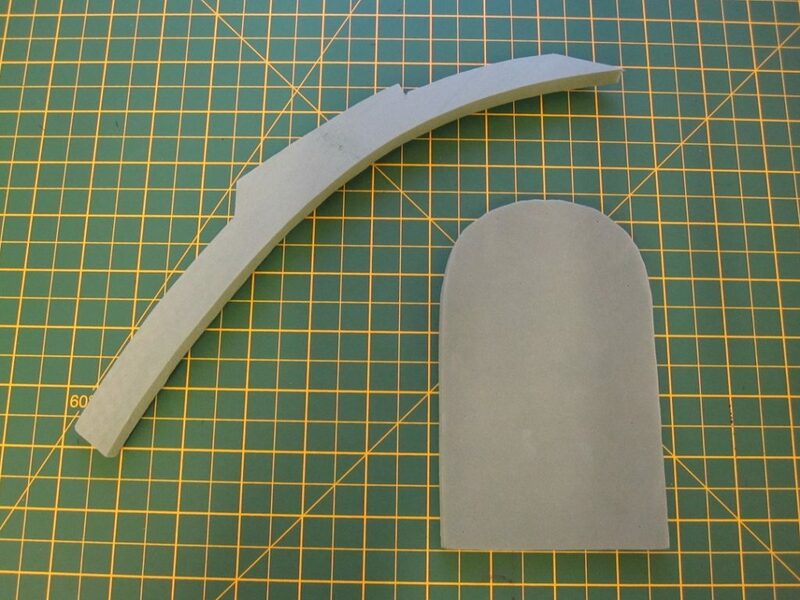 So all that remains now is to cut out a small notch so that the assembled parts will fit together. 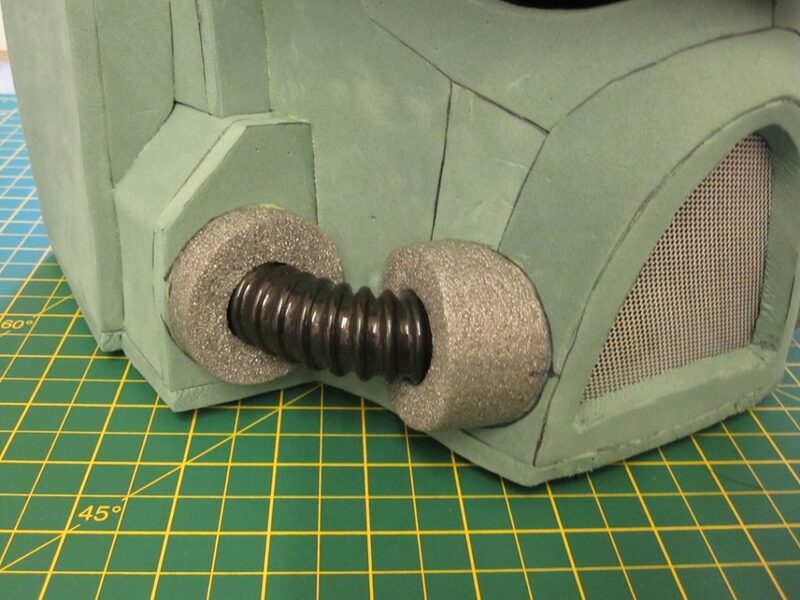 Now the face assembly can be attached to the ear guards. 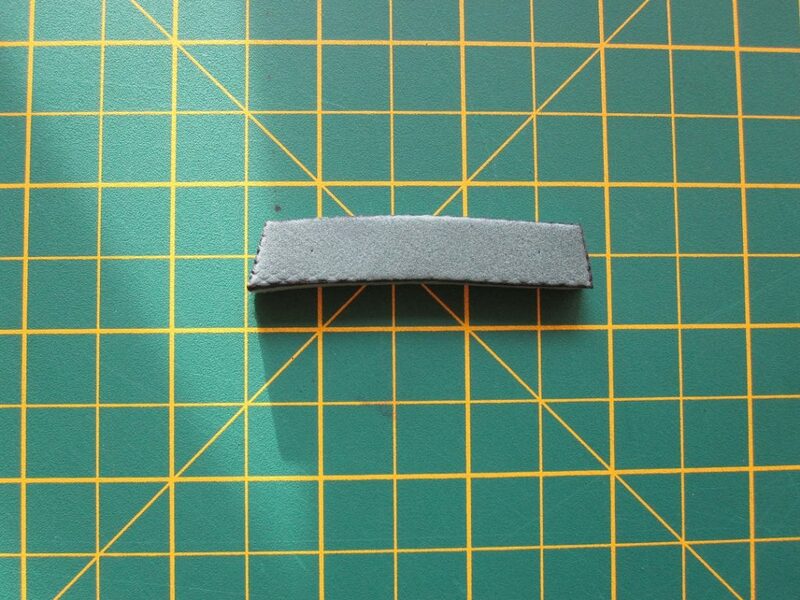 Use the notch to line up the parts. 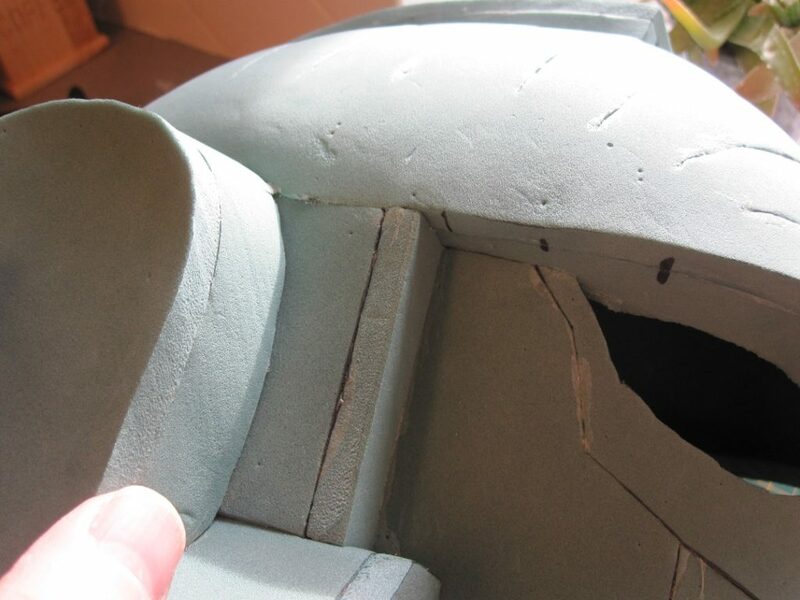 And then the assembled pieces can be stuck to the helmet base. Don’t worry about the protruding lip at the front. That gets trimmed off later. You can also stick down the other end of the eyebrows part. Alignment is is somewhere between the angle of the two trailing edges. 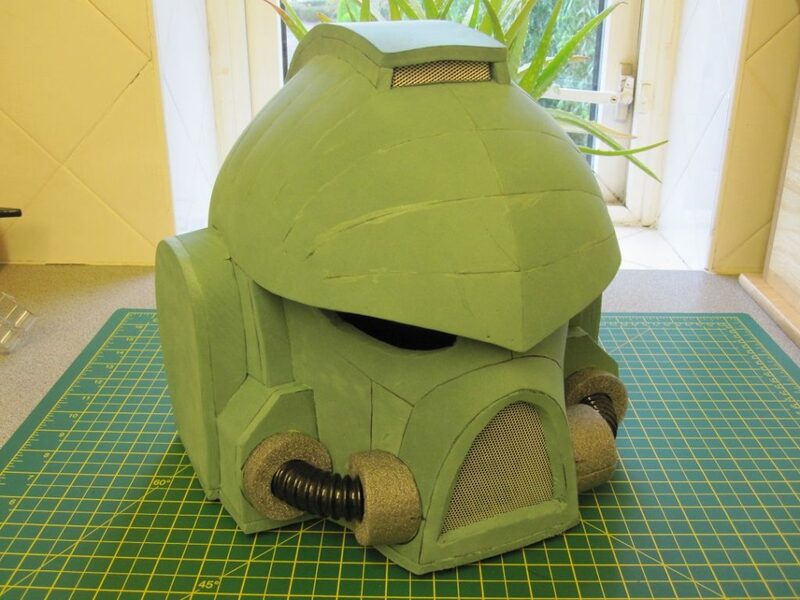 Congratulations, you’ve completed half a helmet. Now time to assemble the other half. Now before diving in, I have tried several ways of doing the next bit. It all gets a bit fiddly when trying to bring the two half together. In my head I’m toying with the idea of sicking the “T” piece on last. So feel free to read through the next section and follow it as much or as little as you wish. So stick the fans together on both of the two top parts. 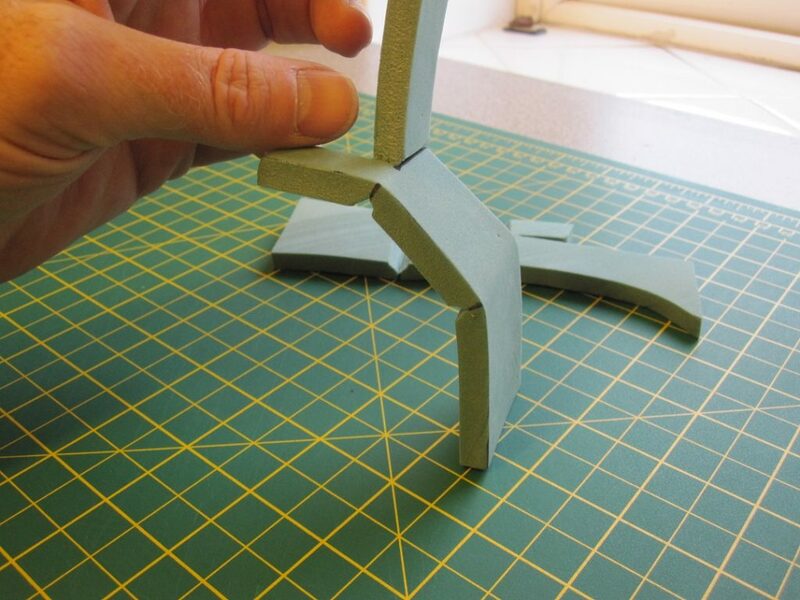 Attach the two risers to the inside of the “T” piece. 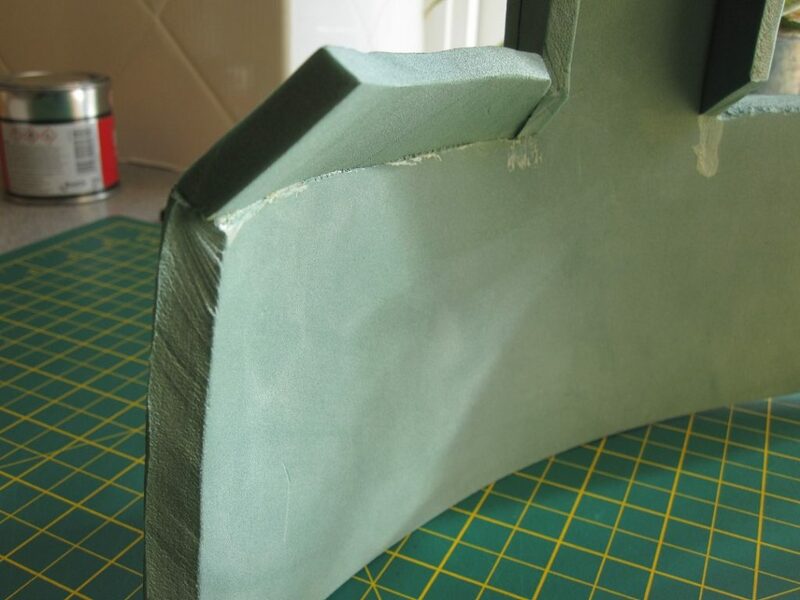 Then add the 2 curved pieces for the trailing edge. Now hopefully everything should line up when you come to glue the fans to the “T” piece. The notch should fit in to the top vent hole. 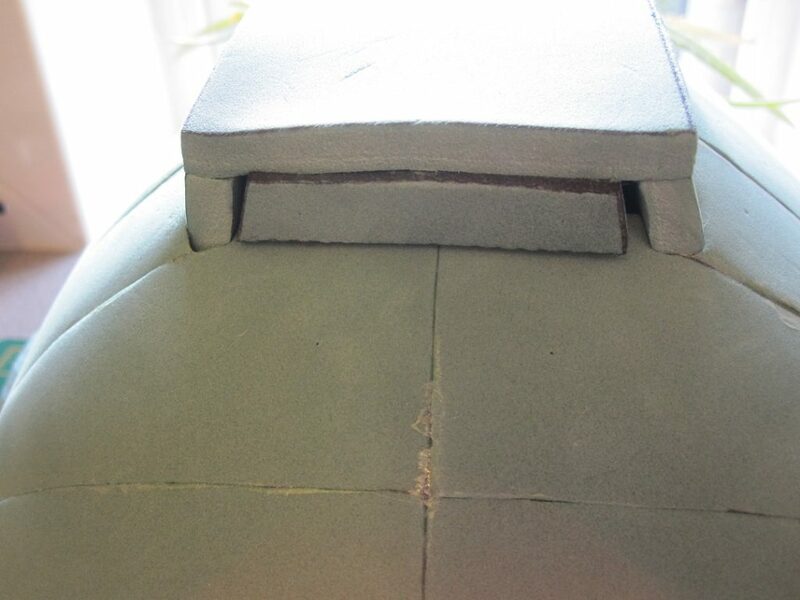 If you wish, you can apply a little glue to the inside to hold the top vent open. Once you have one side in, you should find the other goes in a little easier. 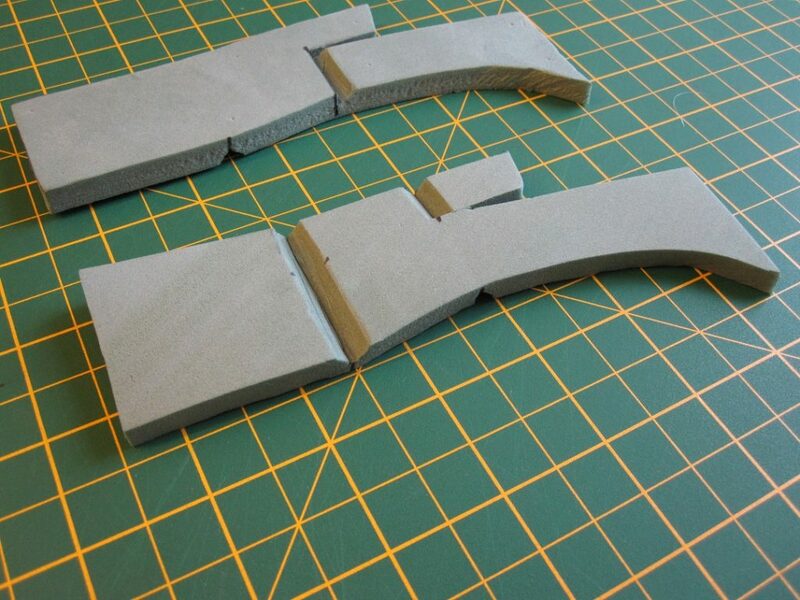 Then just glue the two leading edges down the centre together. 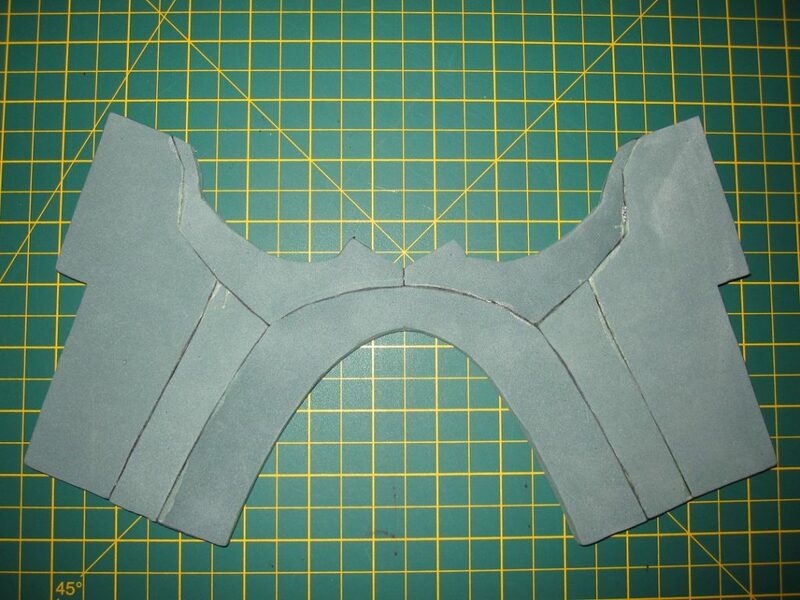 Now before you stick the two parts together, it’s time to make another template to fit the front mouth guard. Pet some paper and a pen / pencil. 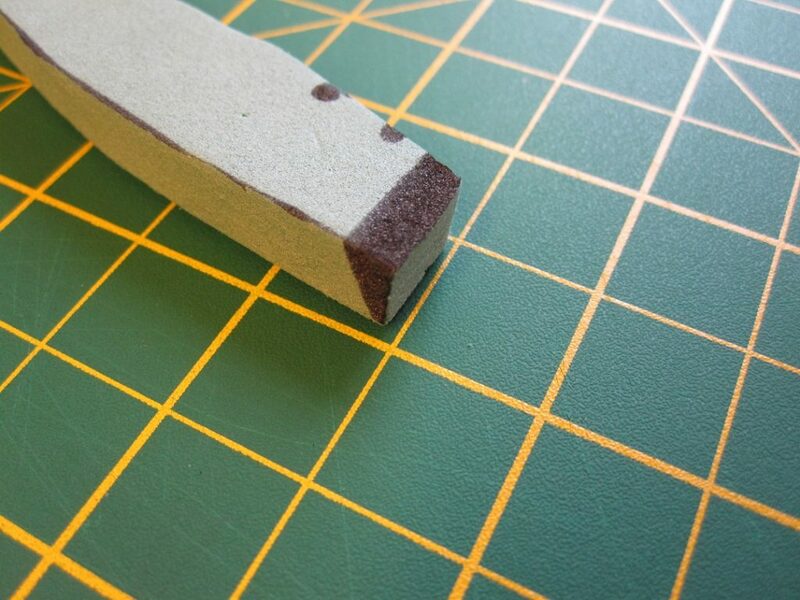 Lay the paper flat with one edge aligned with the edge of your bench / work top. 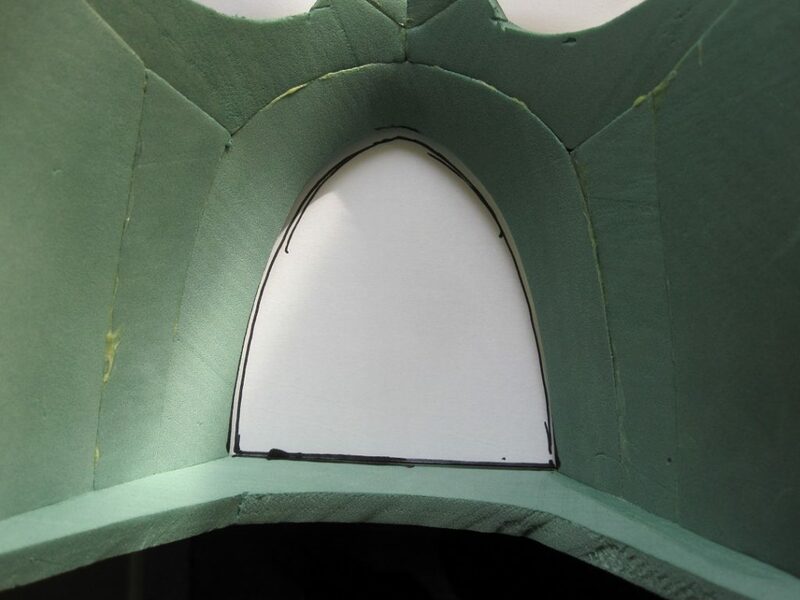 Then use a pen / pencil to trace the inside shape of the mouth opening. 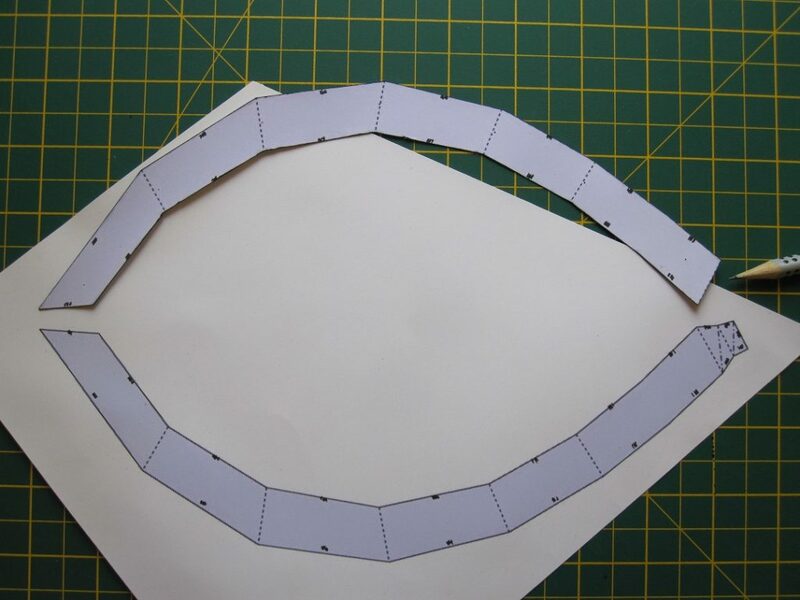 Add a couple of mm (2mm to 4mm) to the edge and then cut out your pattern. 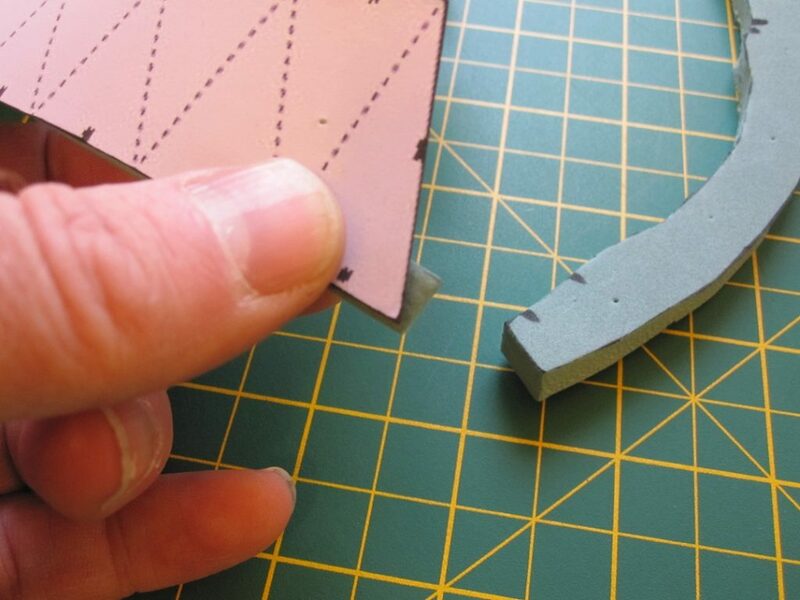 Then cut out your foam with a 45 degree angle cut. 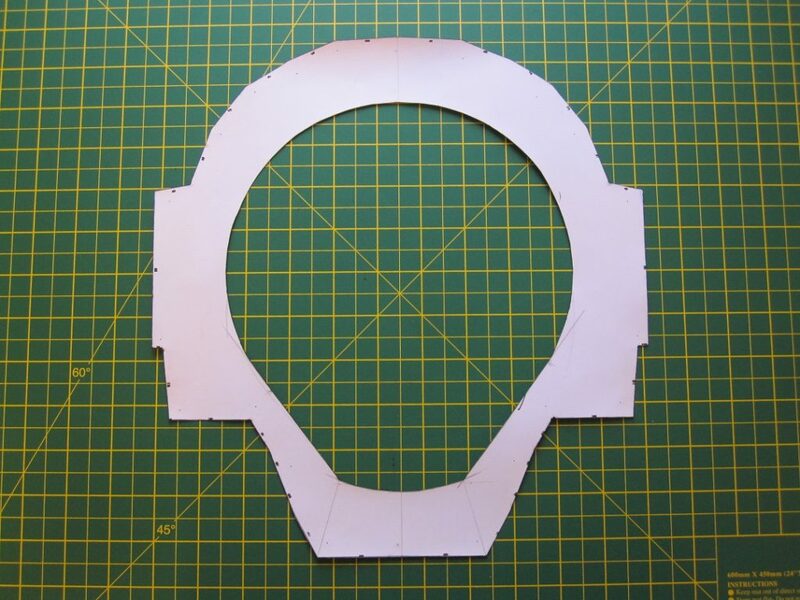 And then cut out the centre to a shape that your after. And this in turn will then be a template for you filler. 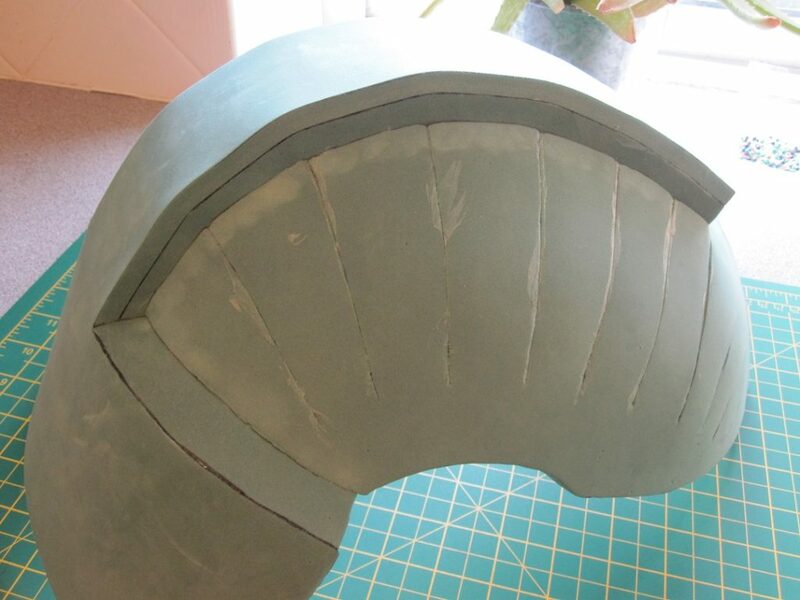 It’s personal preference as to whether you want to just use the cut out foam to blank off the hole. Or use mesh. Or cut yourself some vertical grills. Basically be a creative as you wish. It’s going to be your helmet at the end of the day. 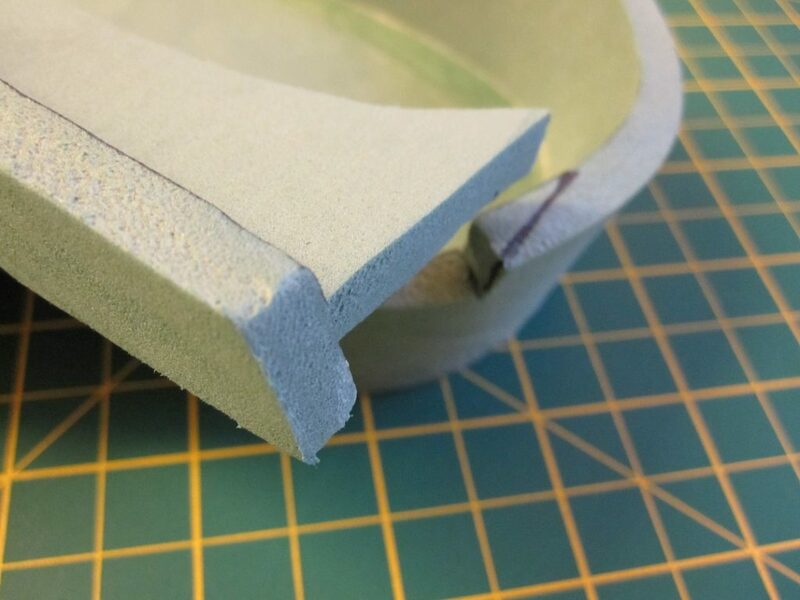 Once you’ve got the part cut out, stick it in place and trim the front edge to line up. And now stick the helmet together. Take care to line up the front lip to the centre. 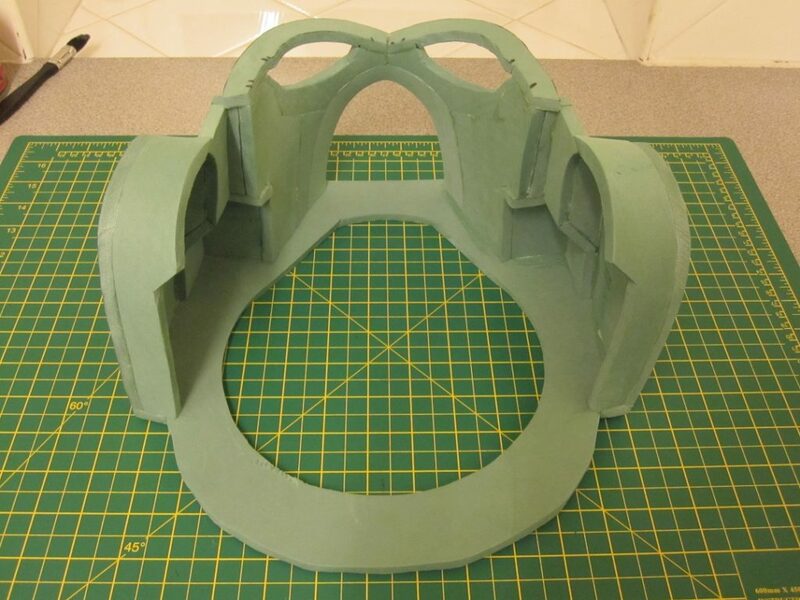 And the curve of the ear guards to the curve of the top fans. 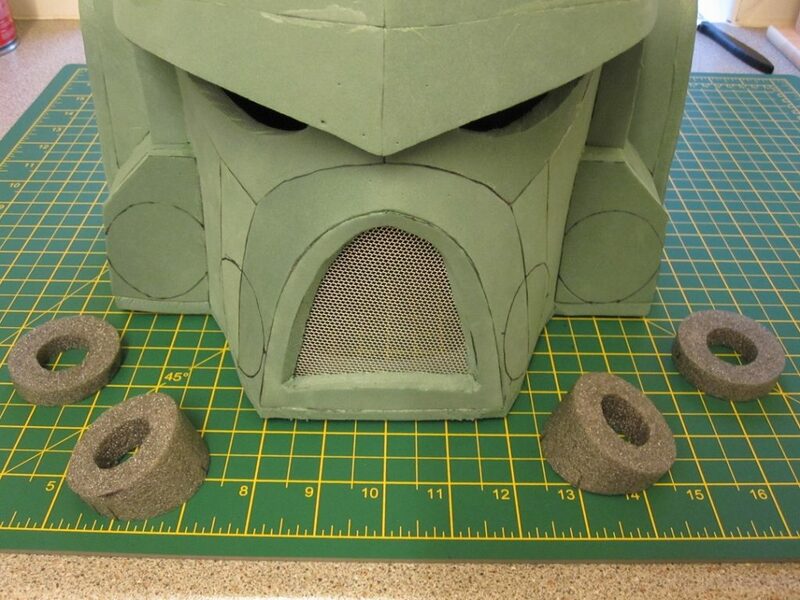 So now that you’ve just about finished man handling the helmet into one piece, you can glue in the mouth grill. 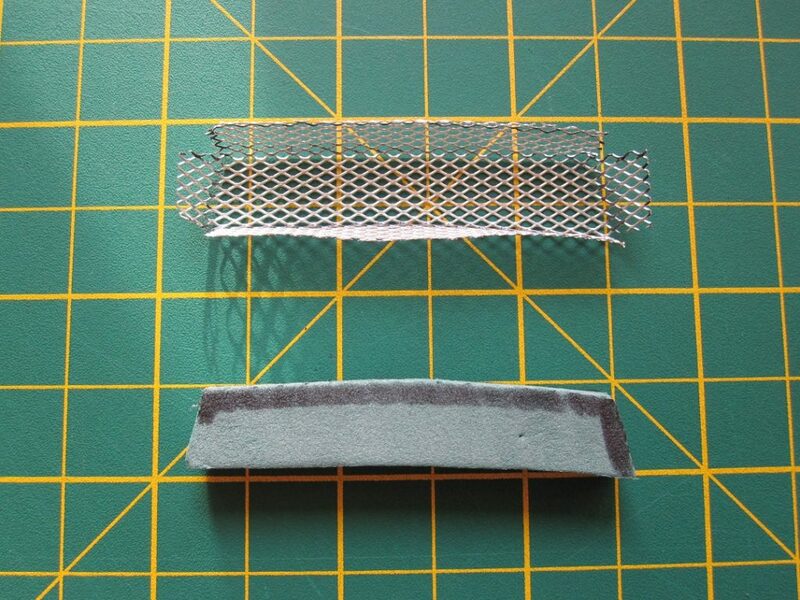 Using the tiny template for the top vent, cut yourself a foam former and some mesh. 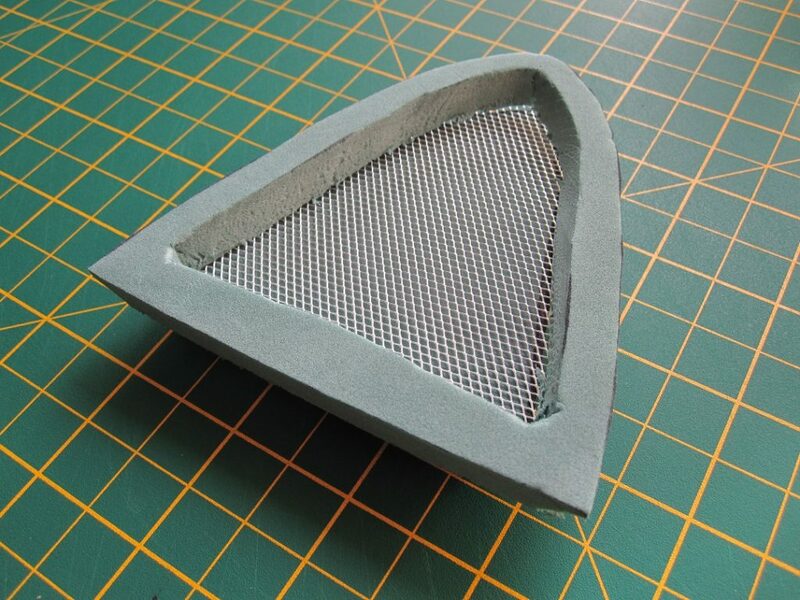 Fold the mesh around the foam form. You can leave the foam in place should you with, or take it out. Again, up to you. 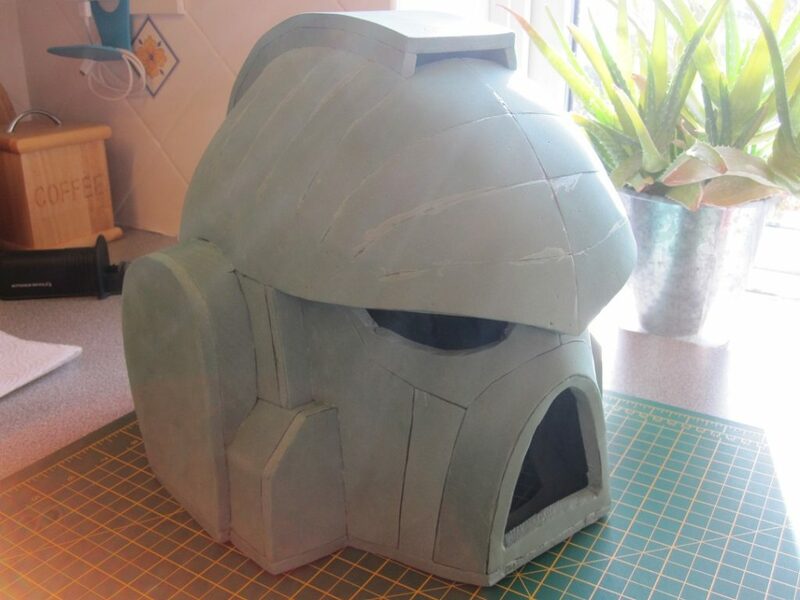 You can glue this in now or after you’ve painted the helmet. Looking good. And again, personal preference to how much or little you decorate your own helmet. 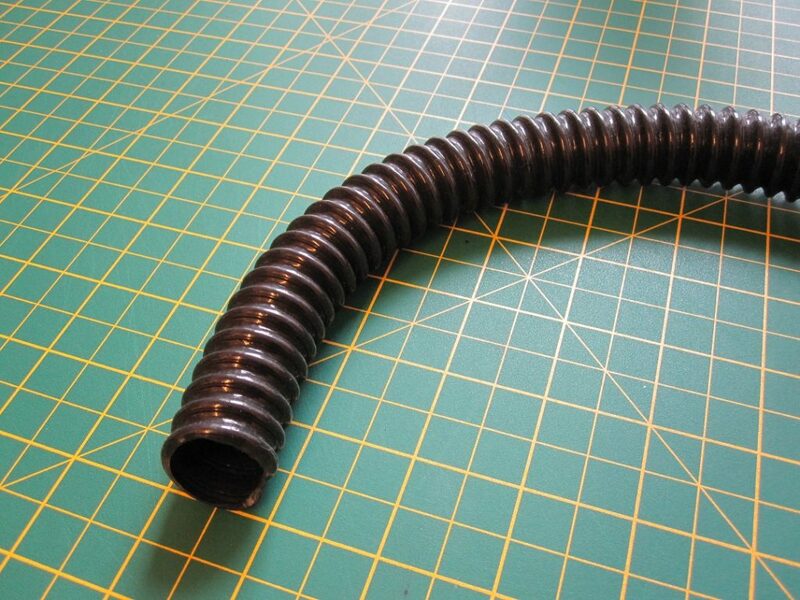 If your looking to add the pipe work, then pipe lagging foam and spiral hose is cheap and works well. Basically part one should fit into part two. Not much is needed. Cut yourself at least 12cm. 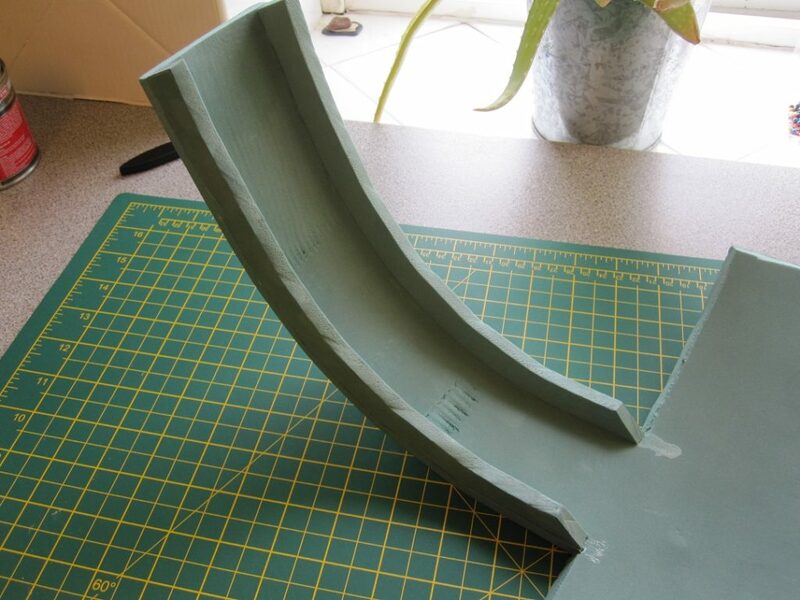 Then slice yourself some of the foam pipe lagging. Don’t forget to angle the cuts for the front pipe mounts. 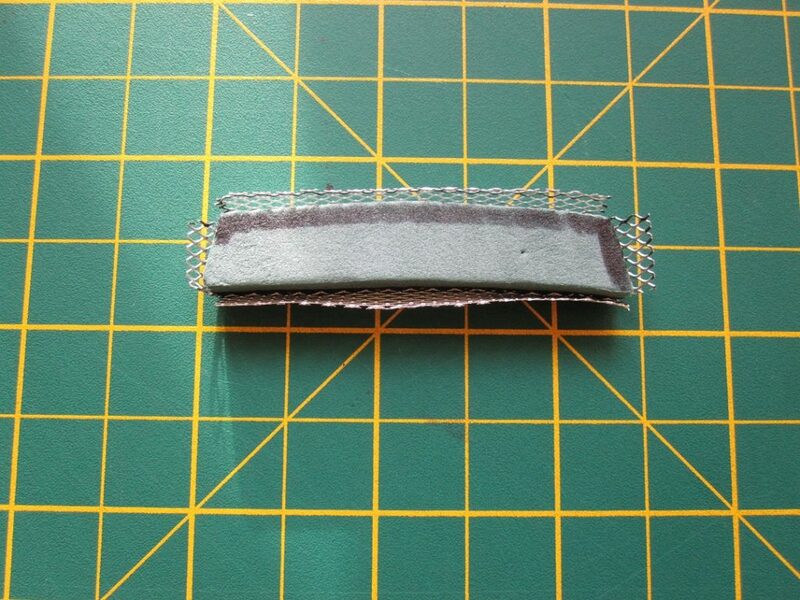 Once the mounts are glued into place, carefully cut out the inner holes for the tube to pass through. And that’s the basic build completed. You can now add your own hat mount. 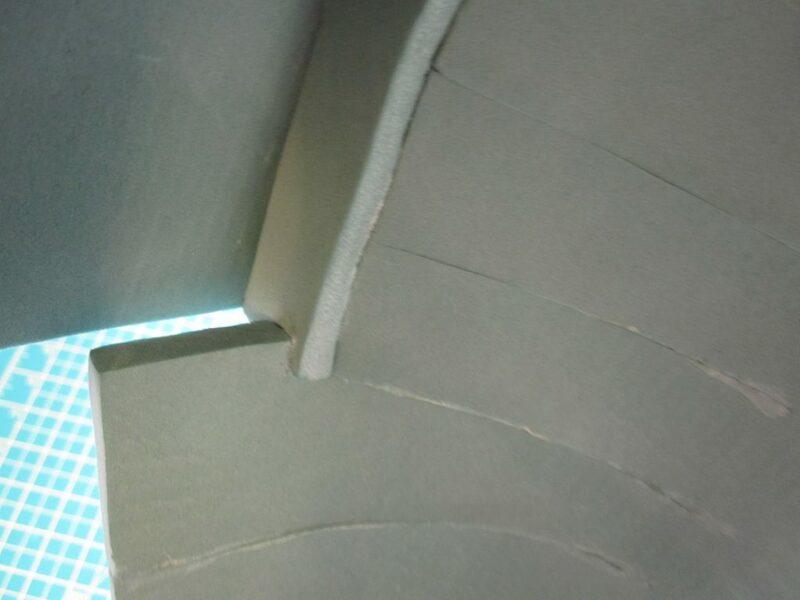 Simple soft blocks of seat foam on the inside will hold it on your head. Or maybe a hat band. Or possibly this will just be a prop. Again, totally up to you. 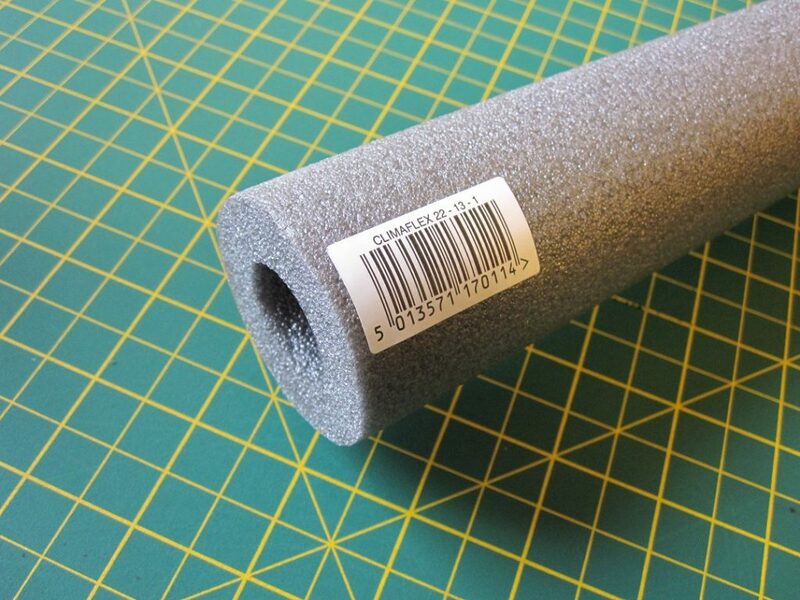 Just seal the foam. Paint it to how you wish. Stick in some lenses inside the eyes. And there you have it. 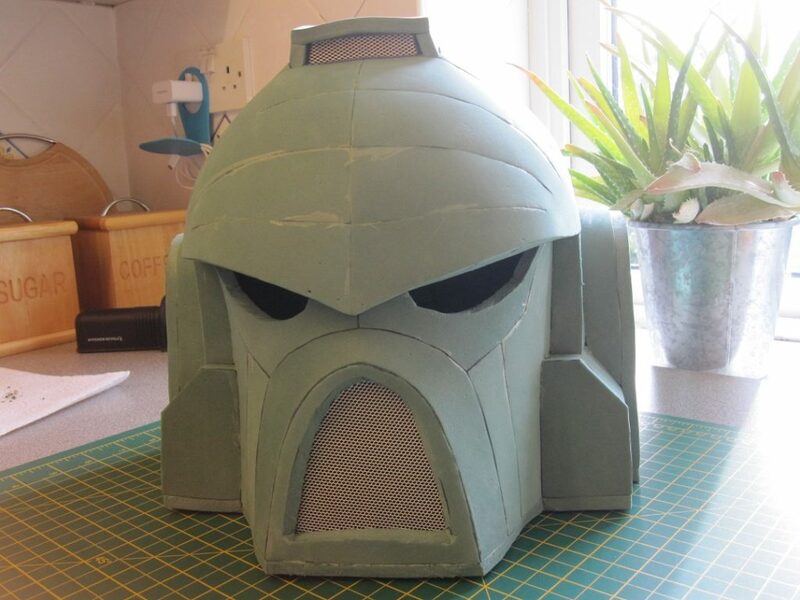 Your very own MK VII Aquila Space Marine helm.